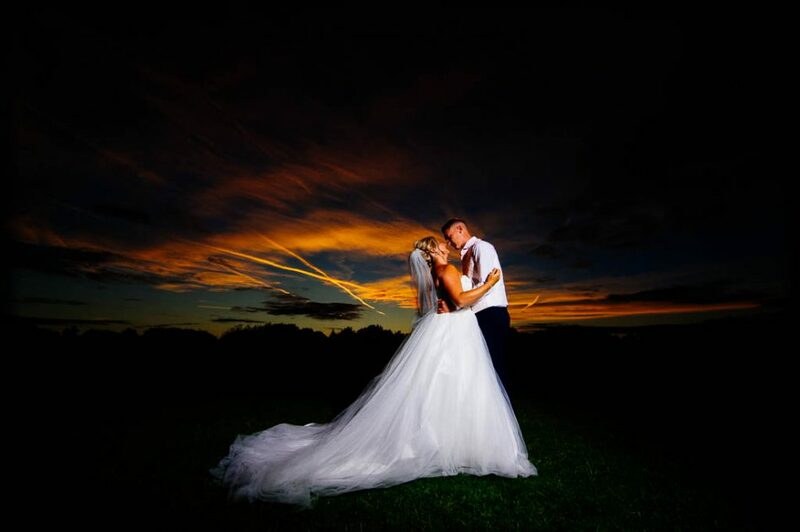 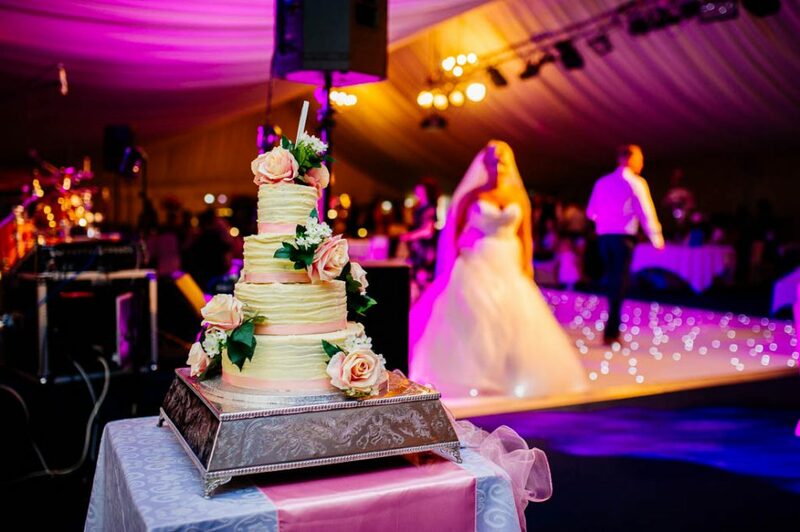 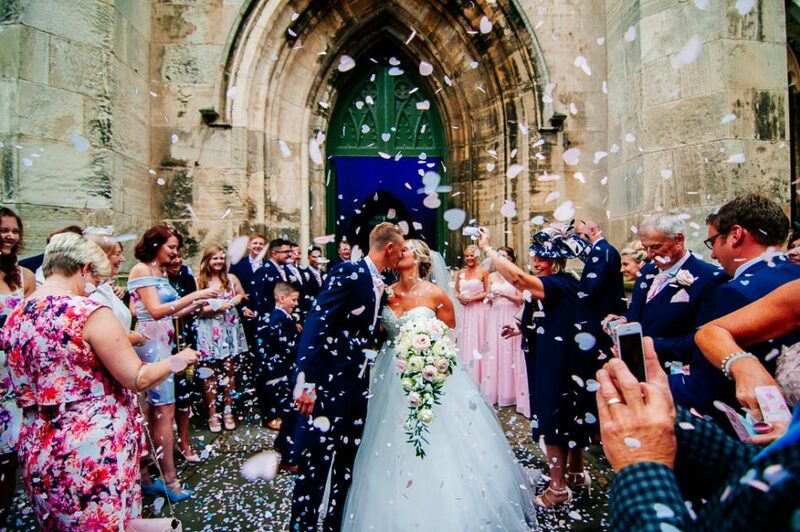 Have you ever dreamed of having a fairytale wedding? 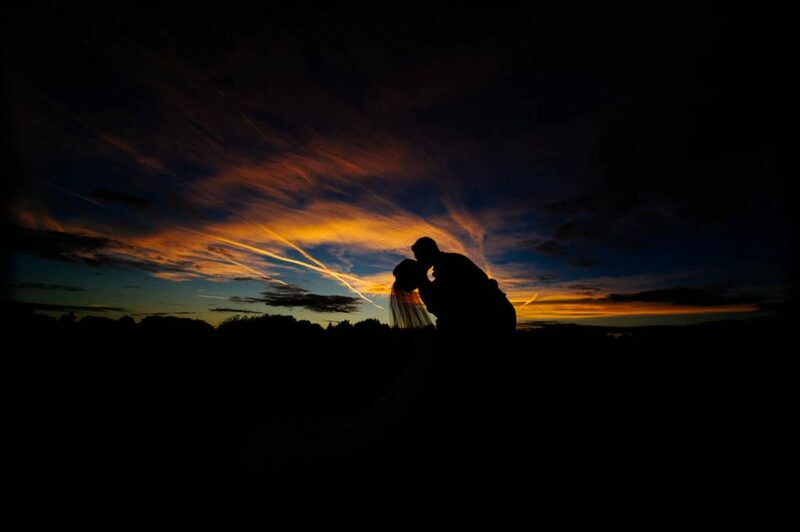 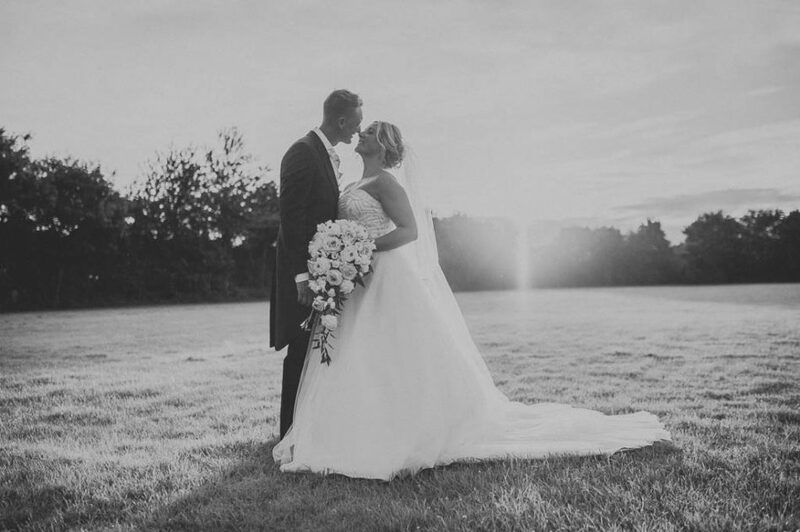 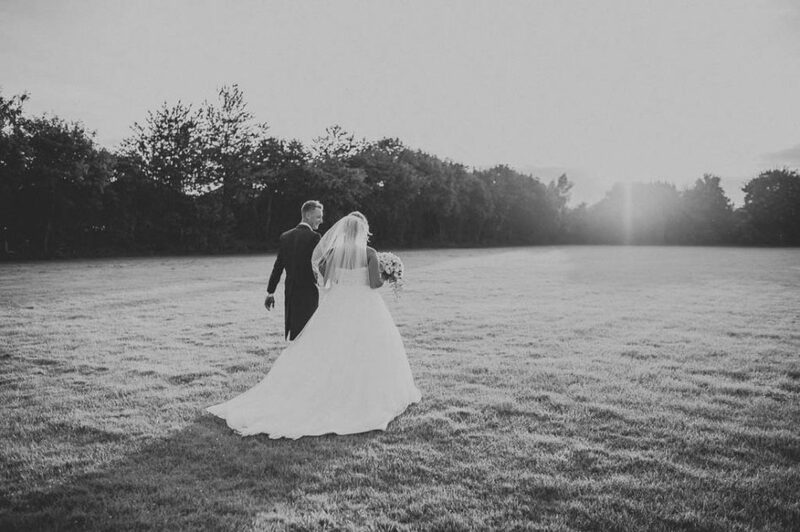 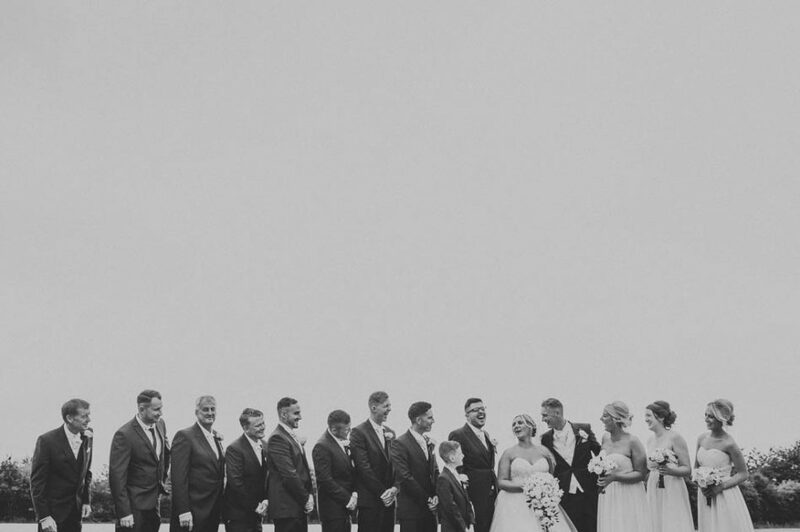 This wedding was truly a dream come true, and I couldn’t wait to share these stunning pictures! 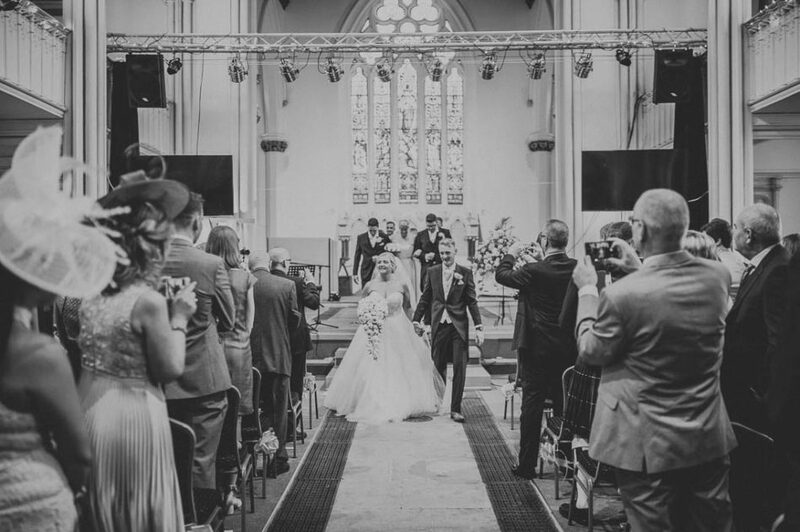 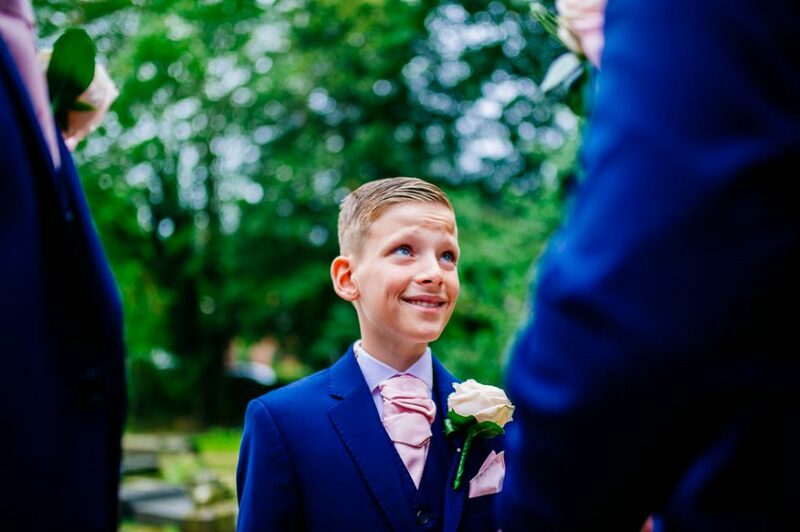 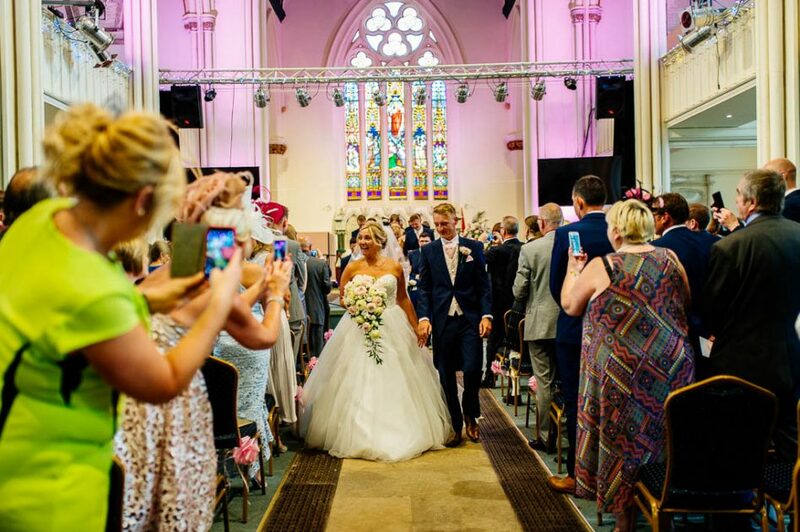 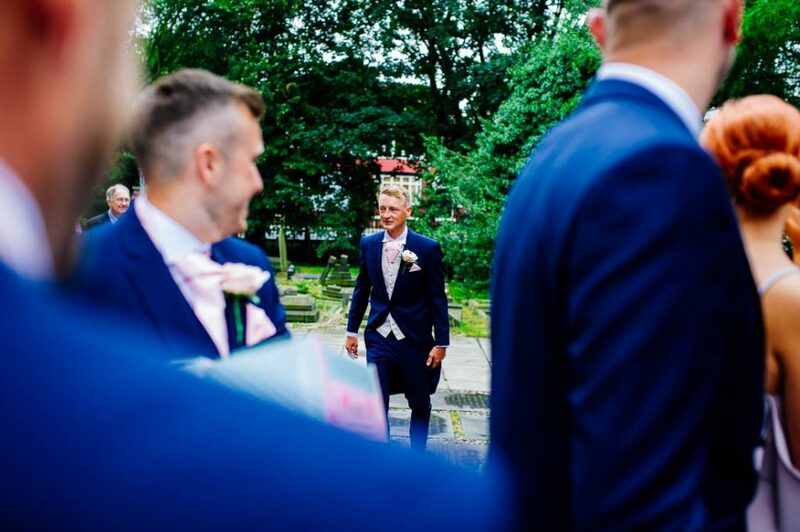 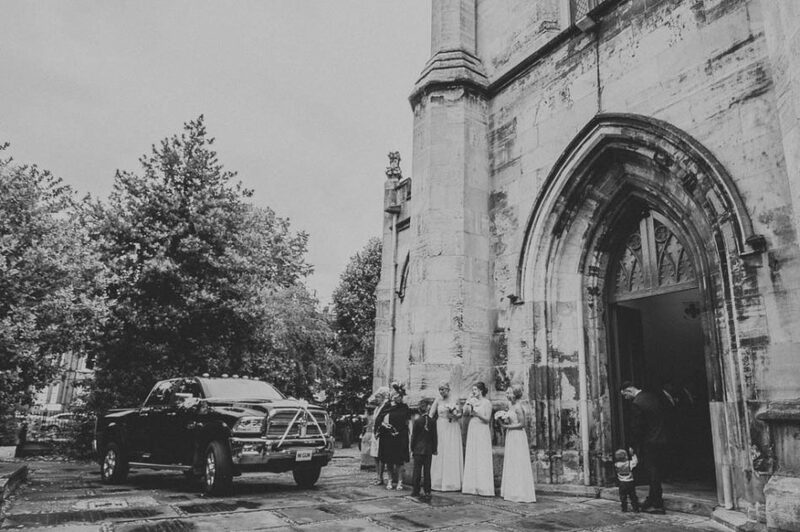 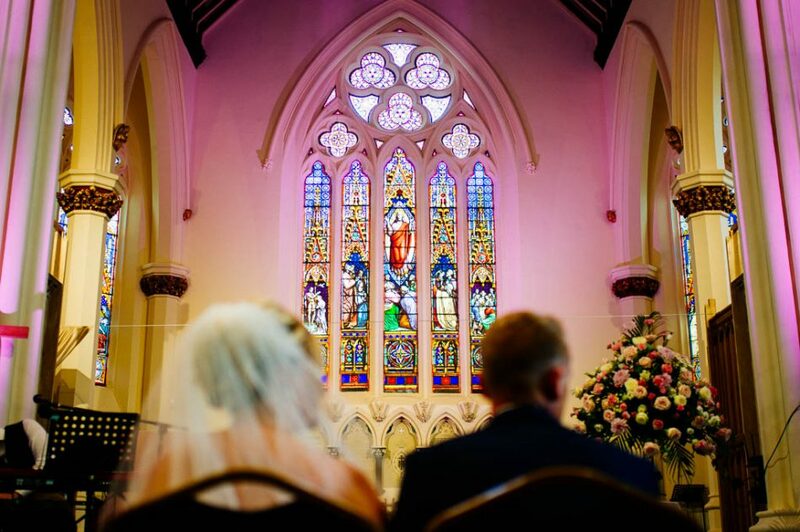 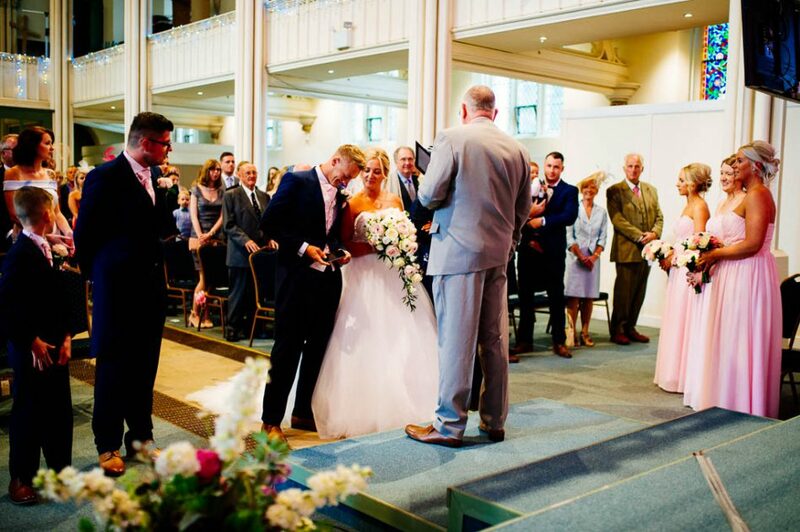 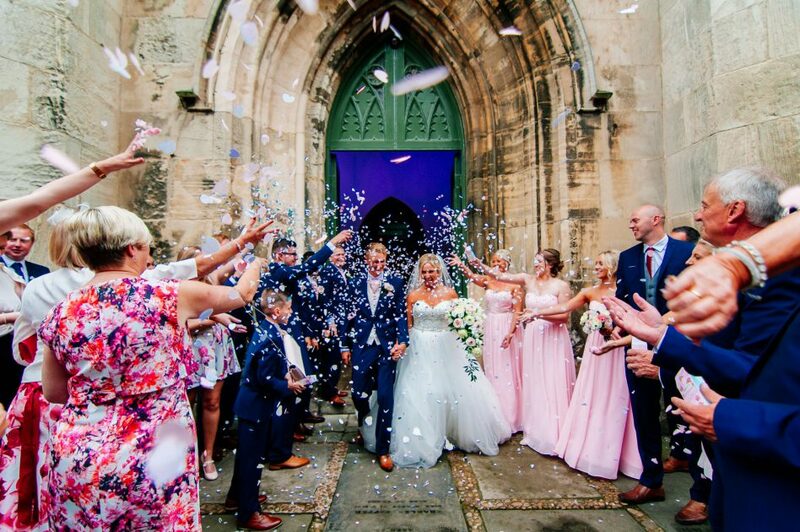 It was a magical day at Christ Church in the heart of Doncaster a small town in South Yorkshire on which we celebrated the wedding of Lisa and Rob. 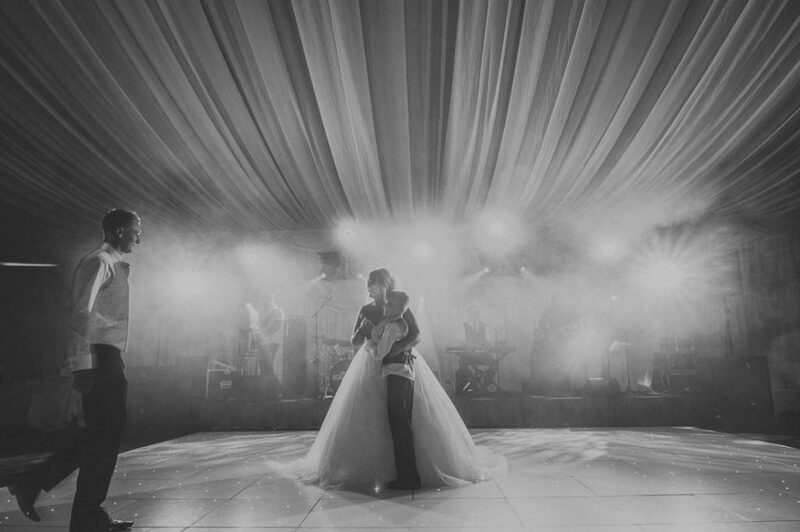 This wedding is what comes to mind when I think of a true fairytale wedding. 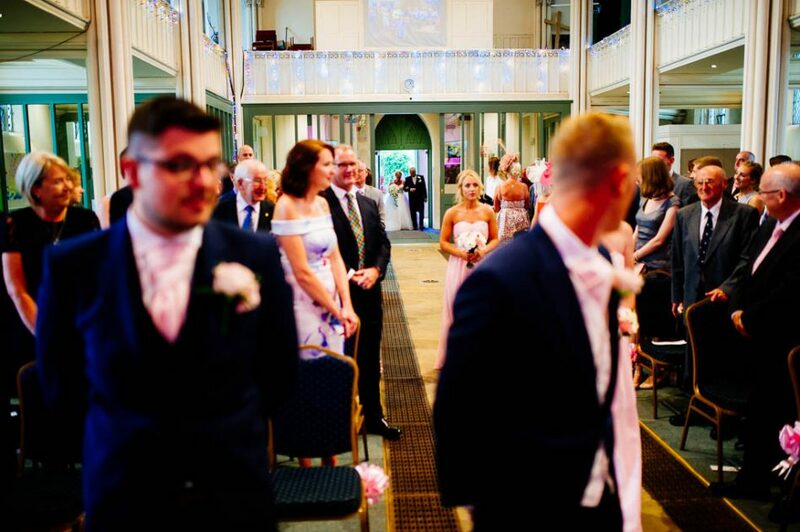 There was a feeling in the air that just sparkled with excitement and love, a feeling that only got stronger as the day continued on. 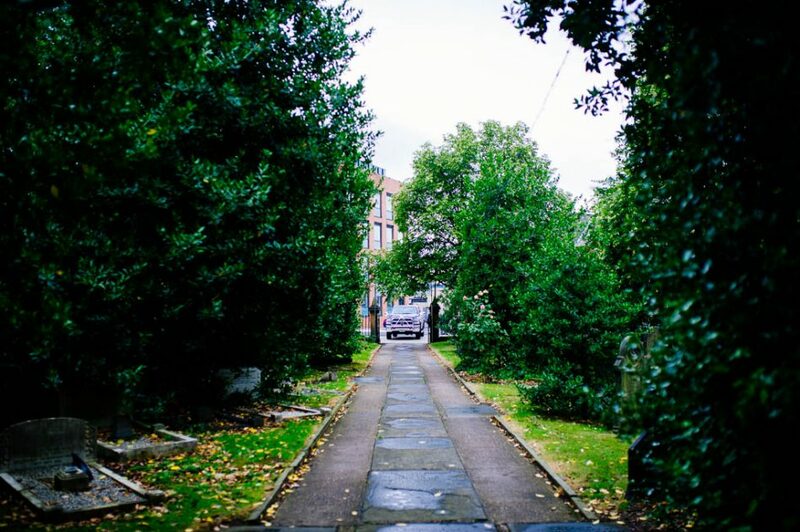 Earlier in the day there was rain, and the afternoon progressed with overcast skies. 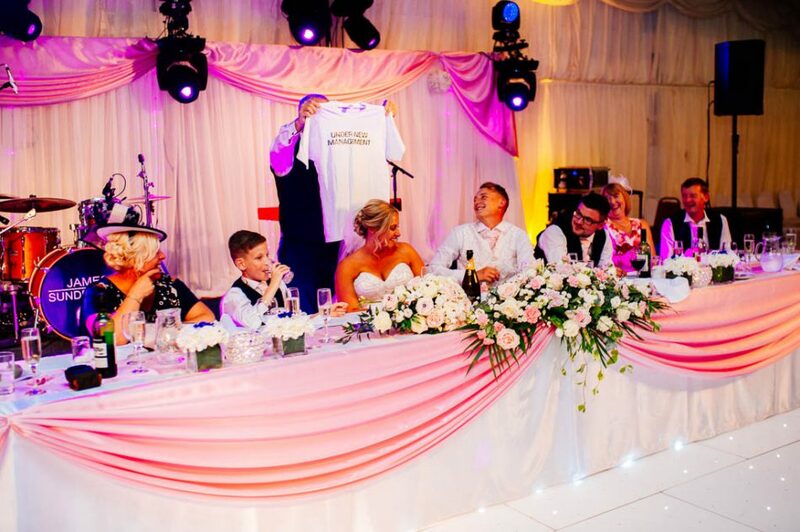 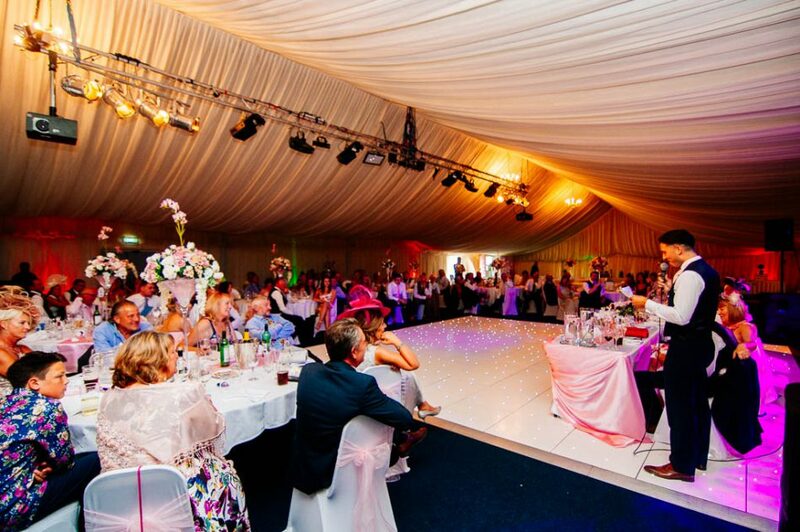 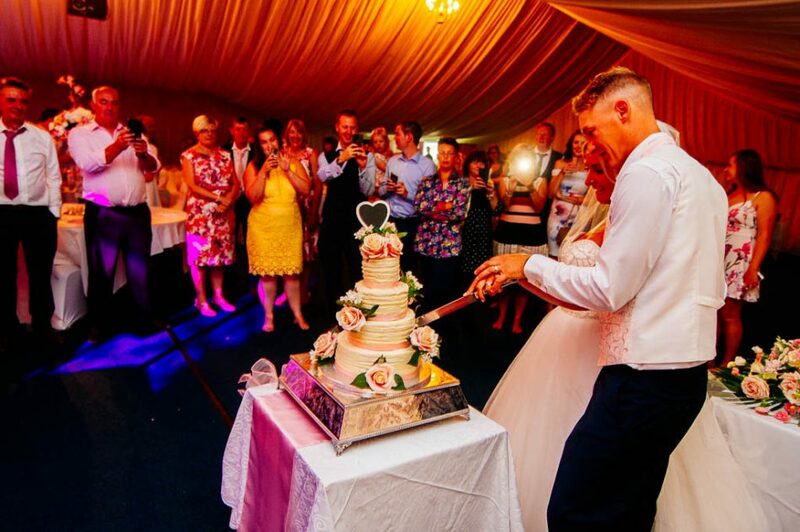 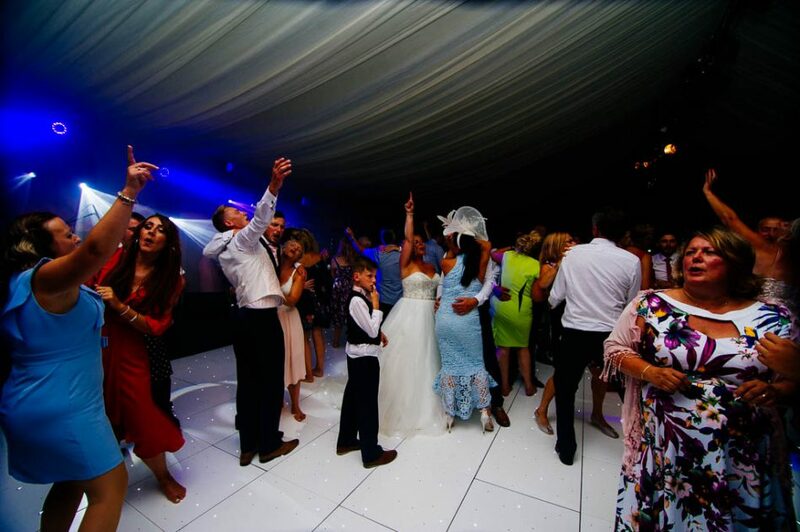 The weather did nothing to dampen the spirits of the wedding party and guests, however. 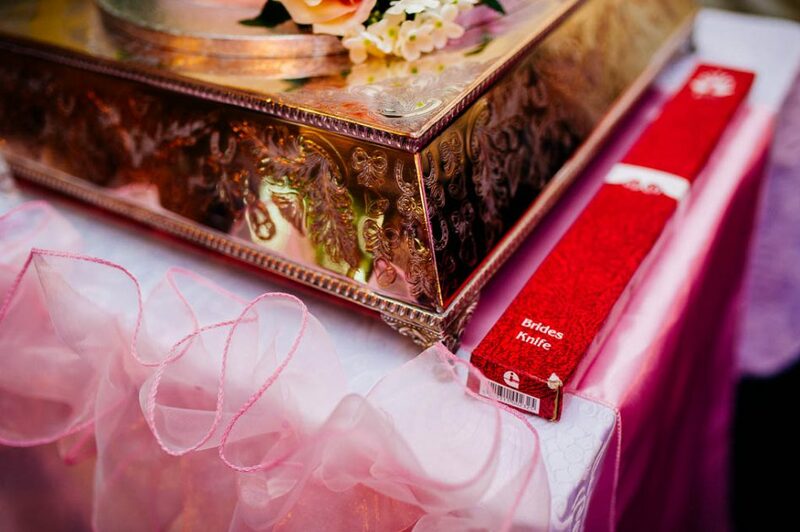 Nothing could overpower the charming, rosy glow cast throughout the venues of the day. 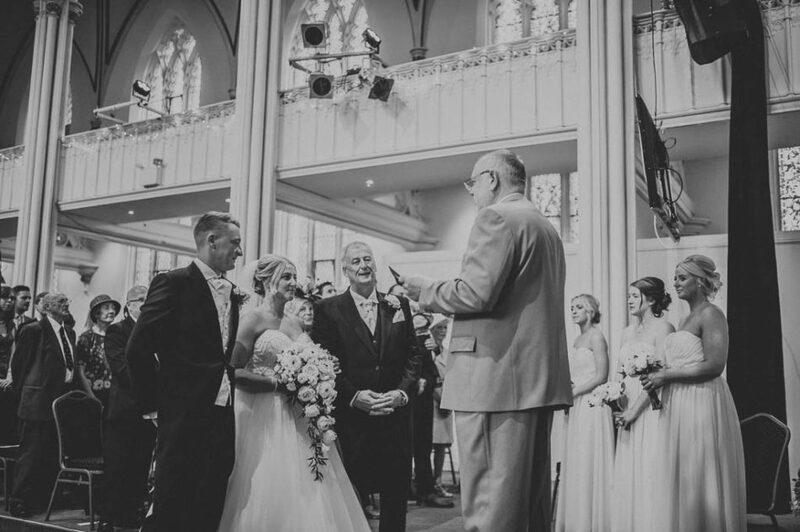 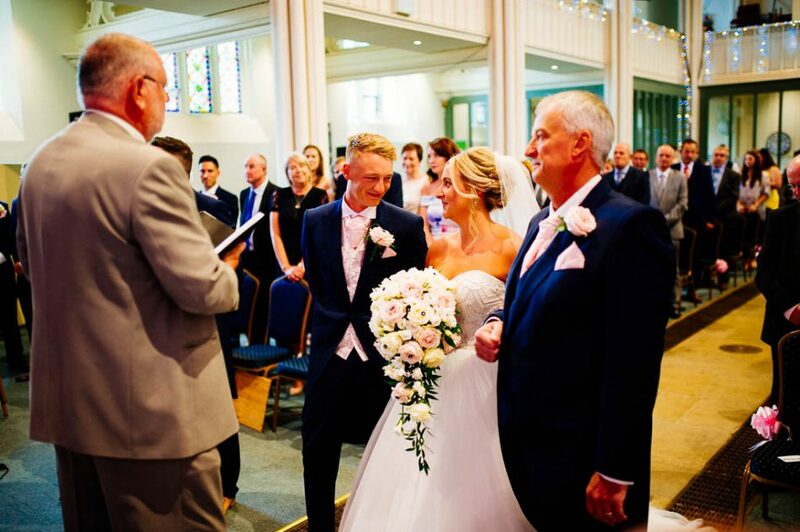 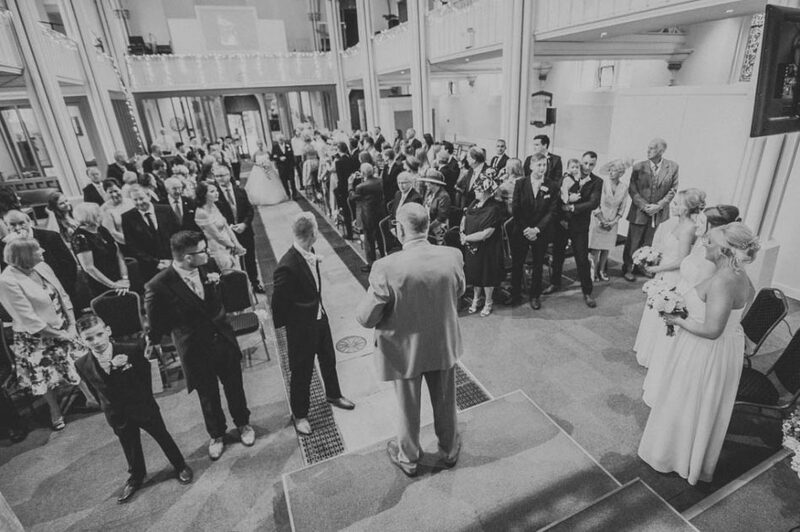 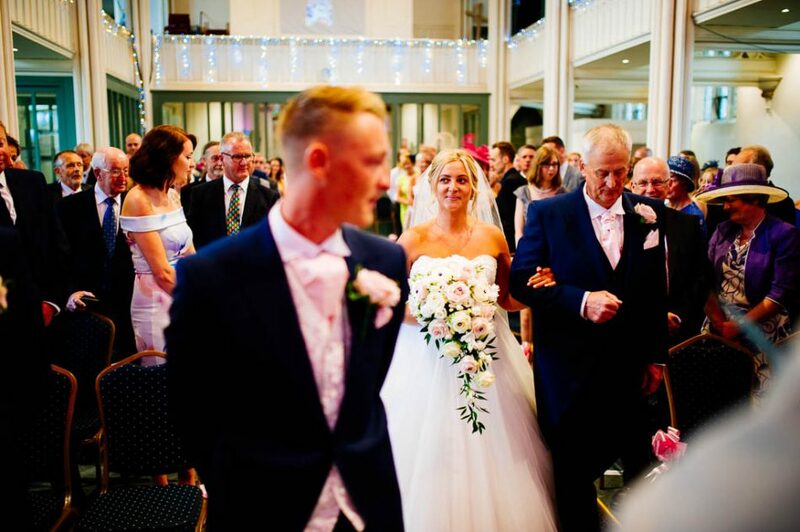 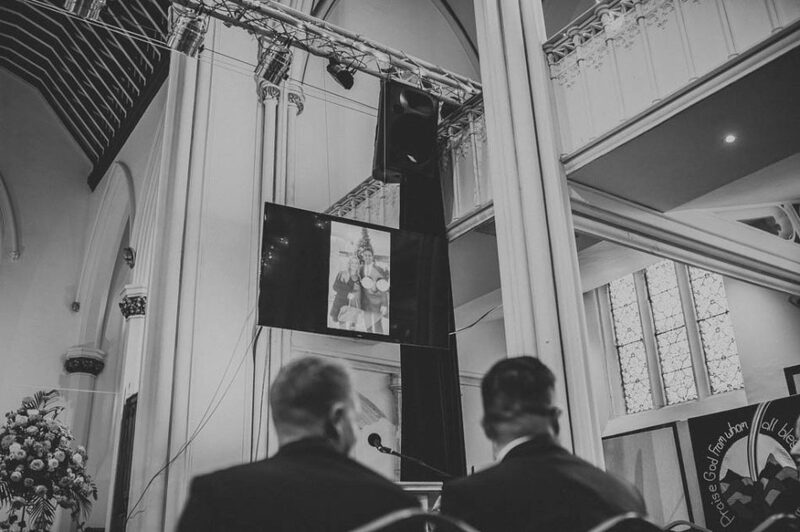 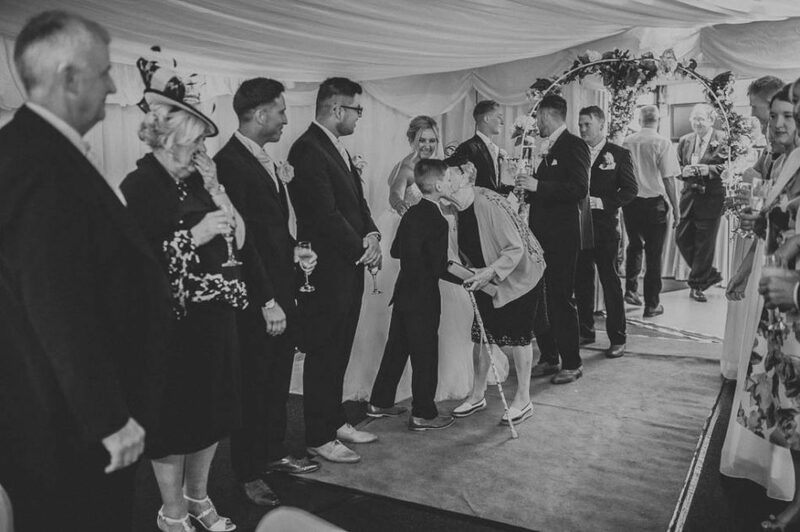 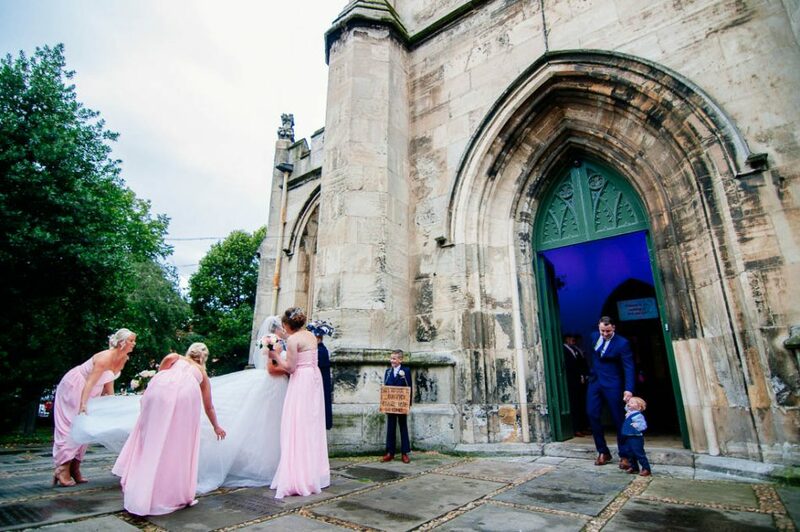 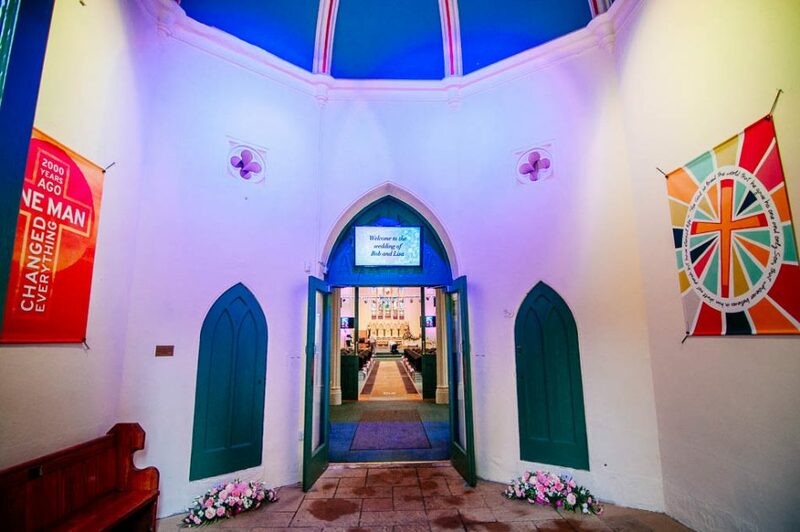 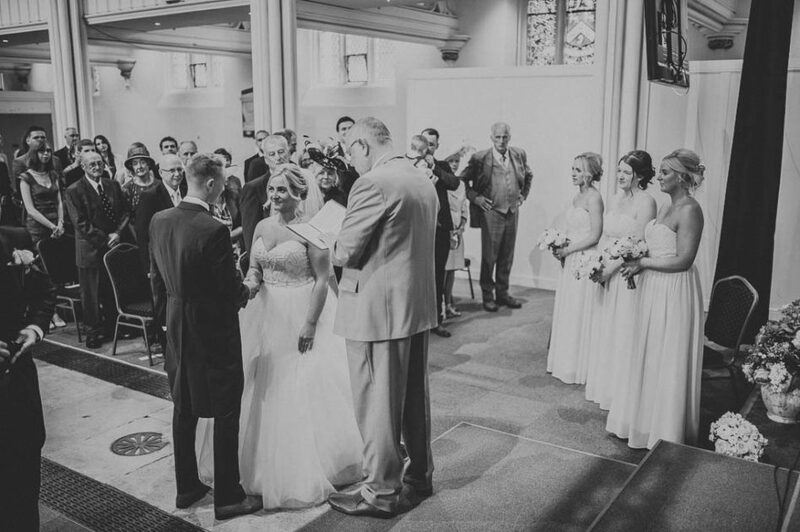 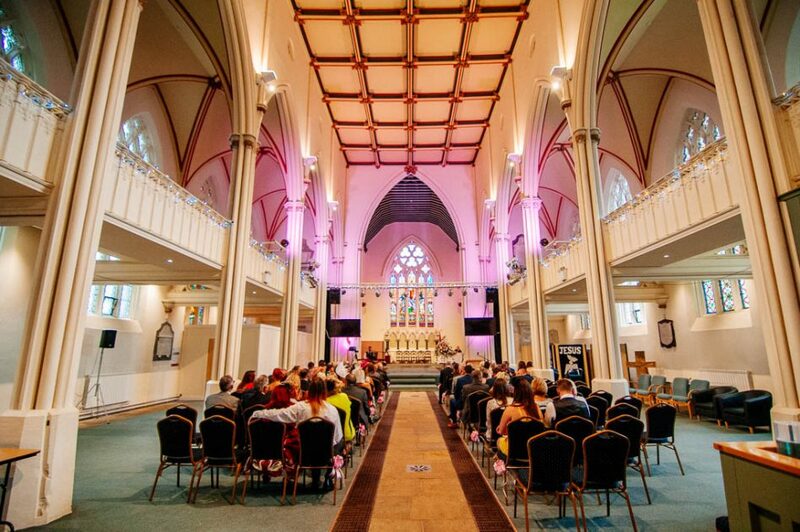 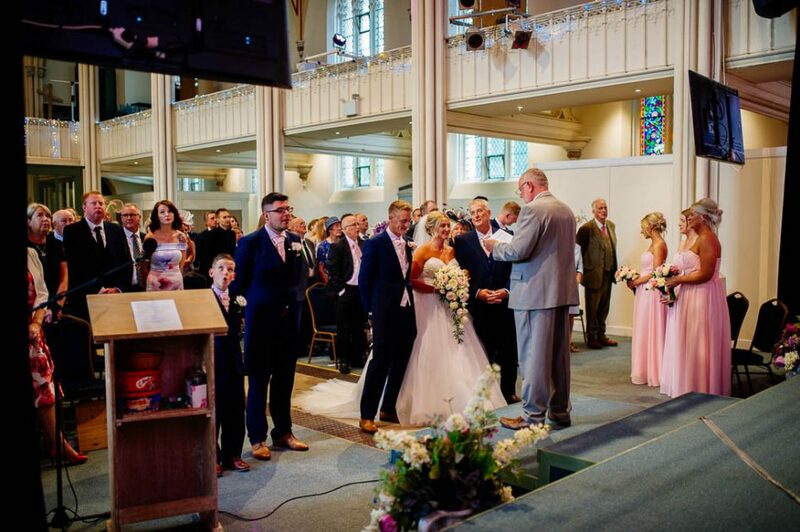 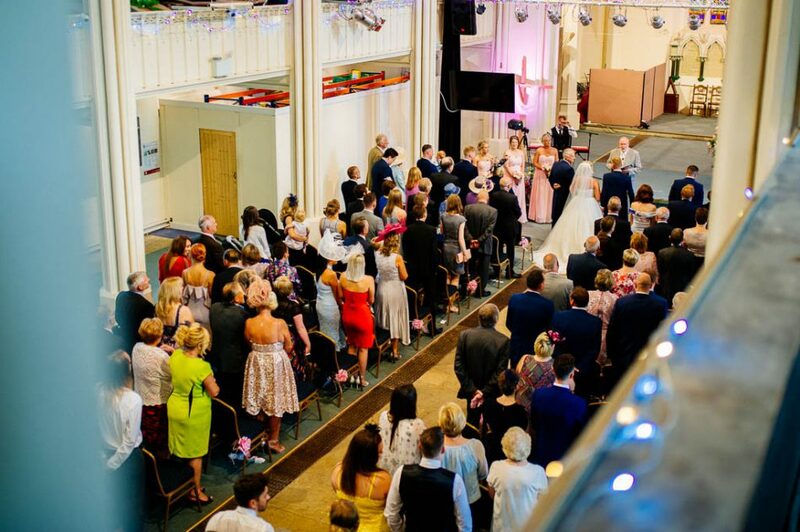 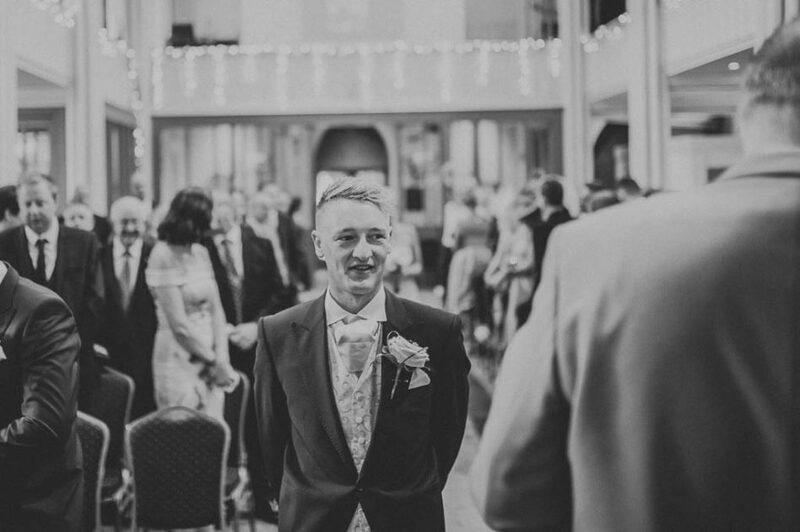 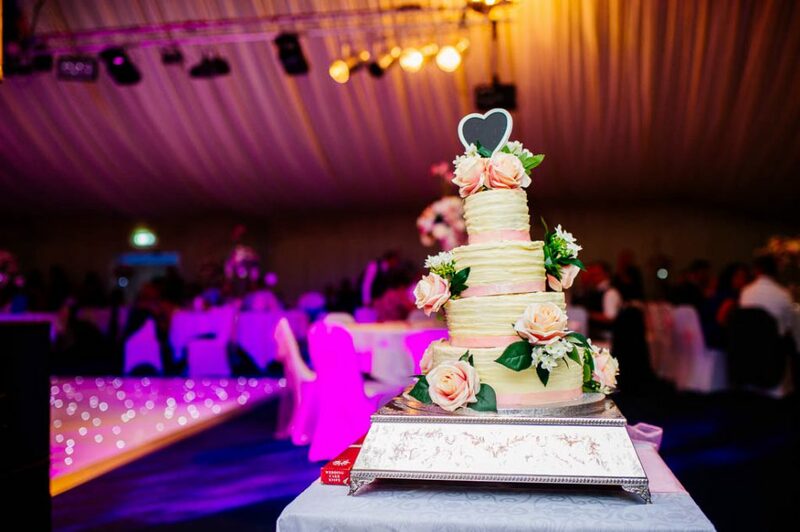 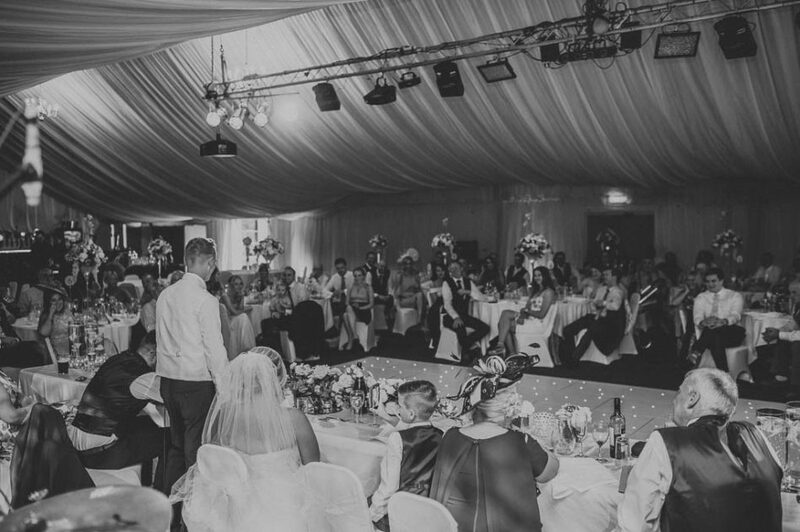 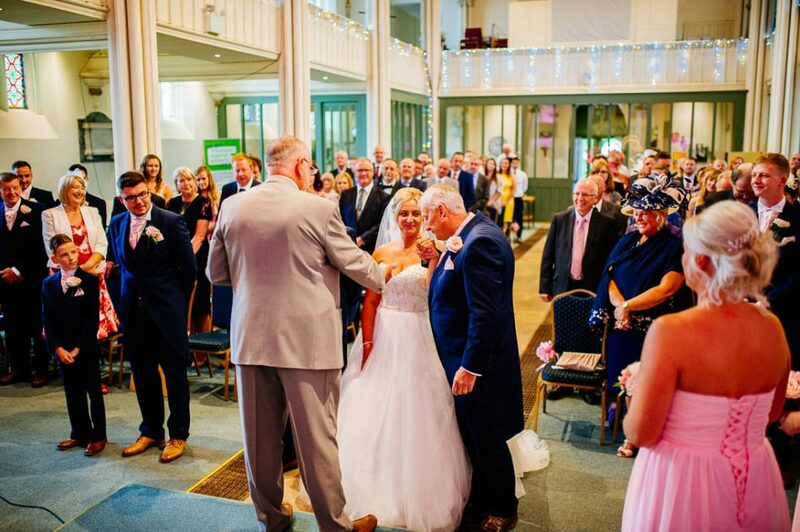 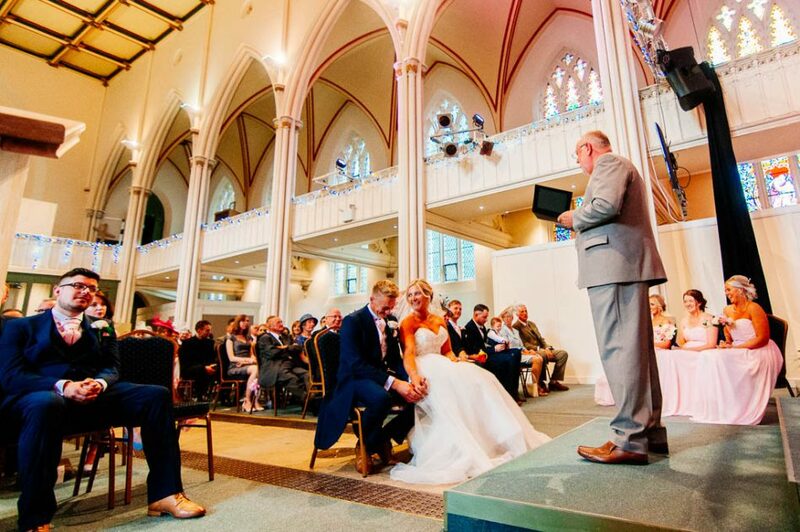 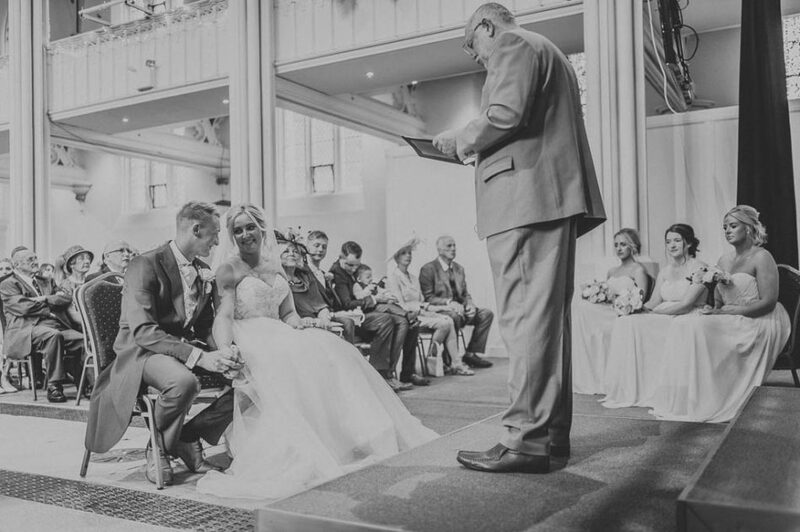 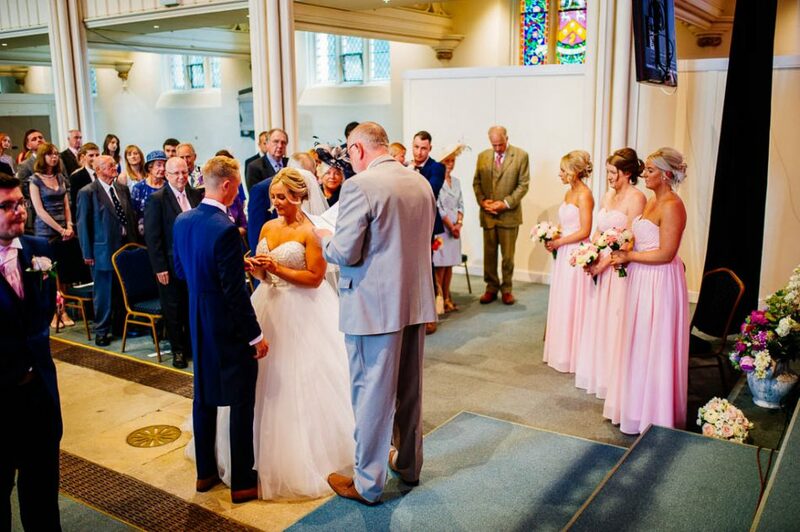 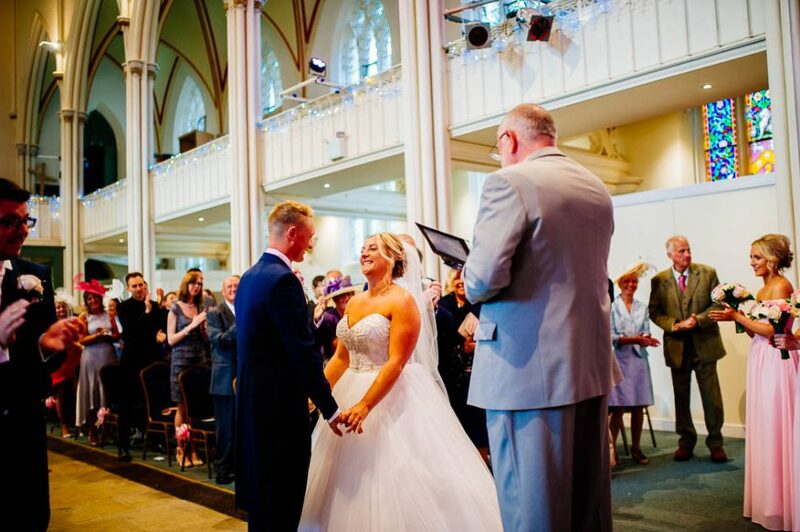 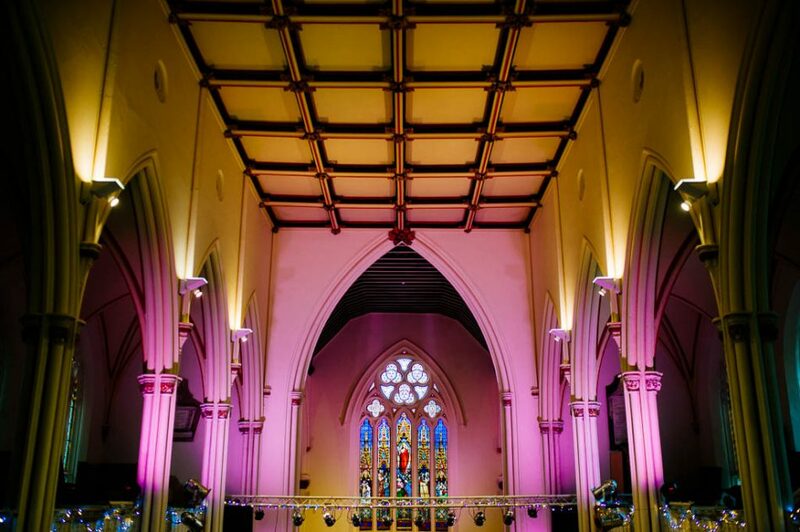 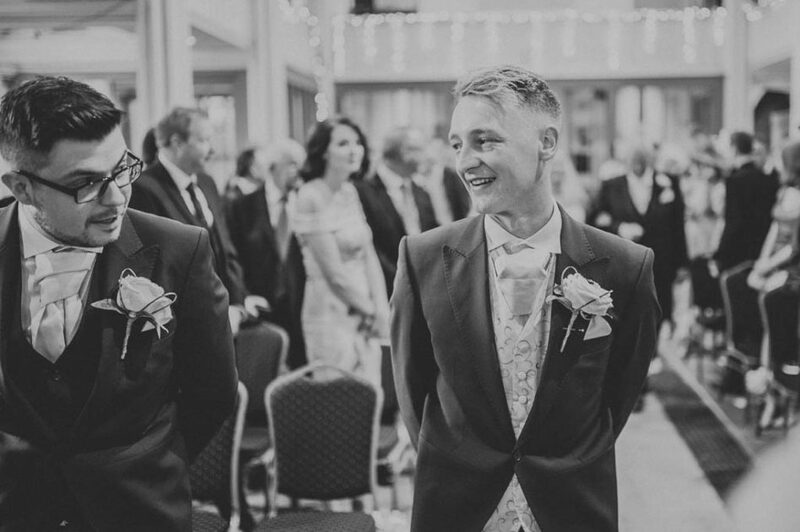 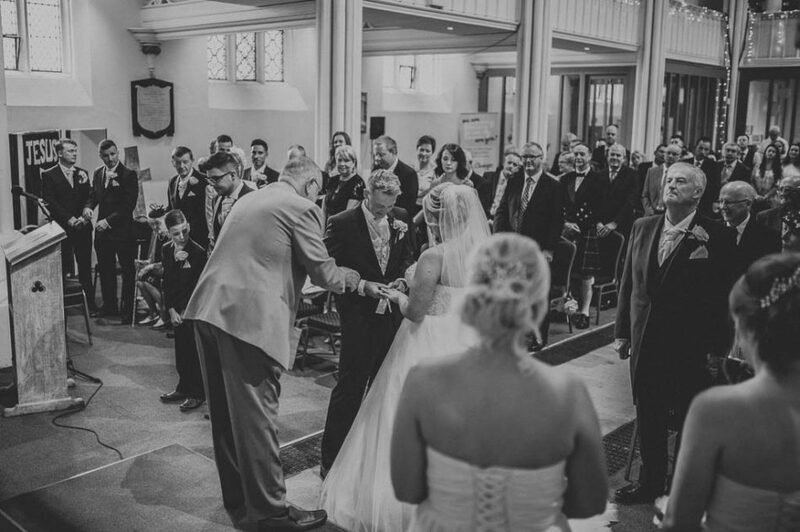 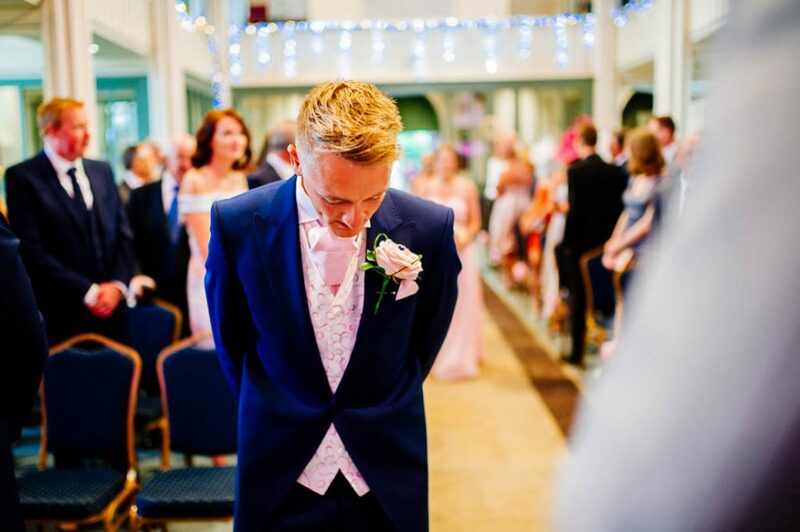 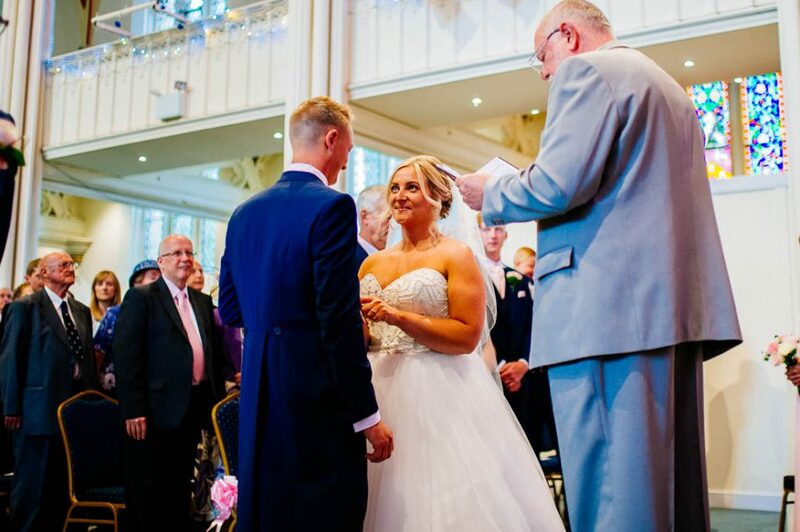 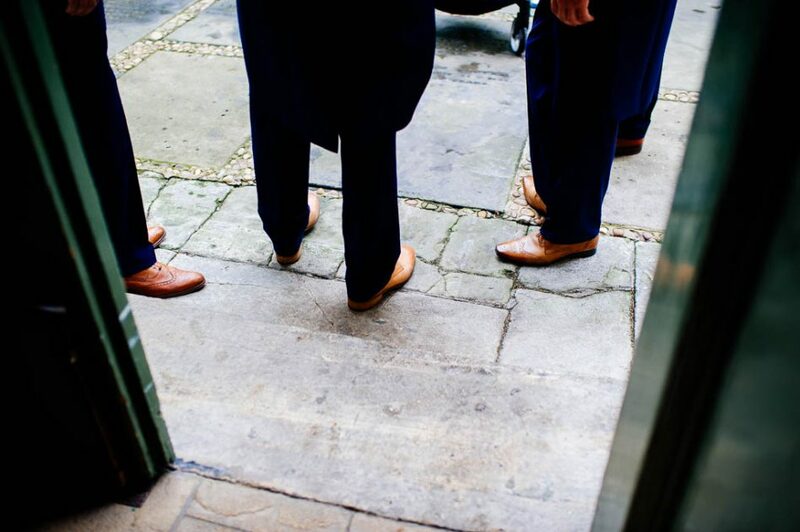 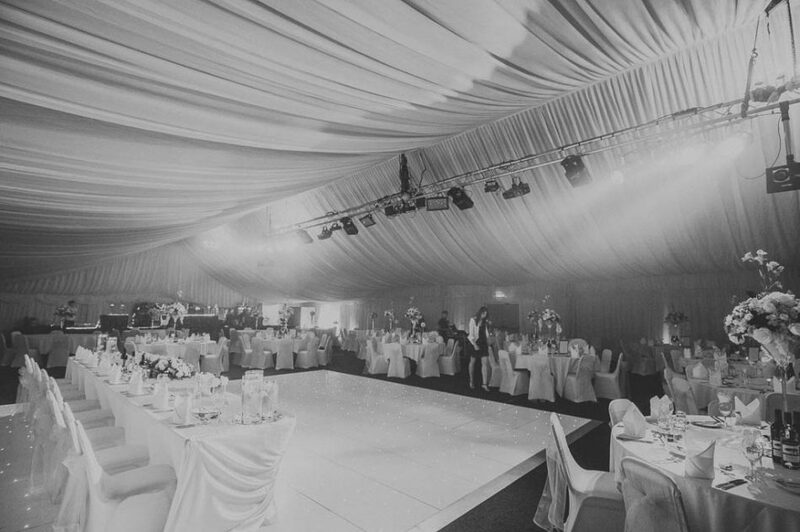 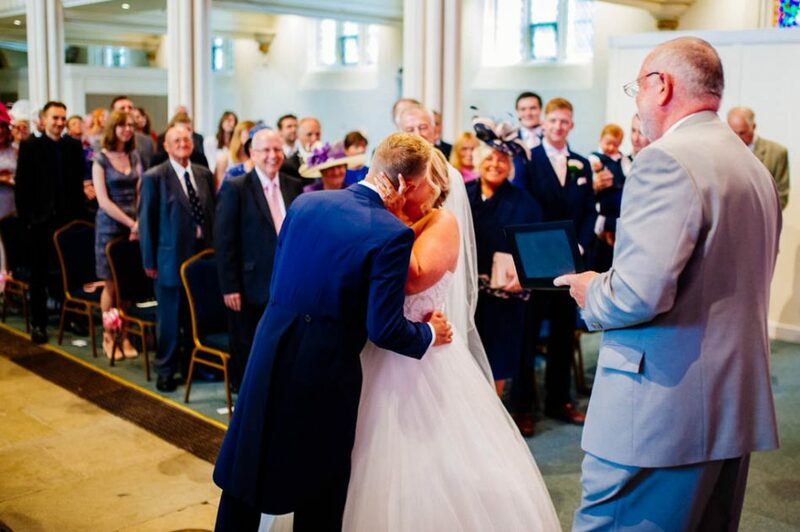 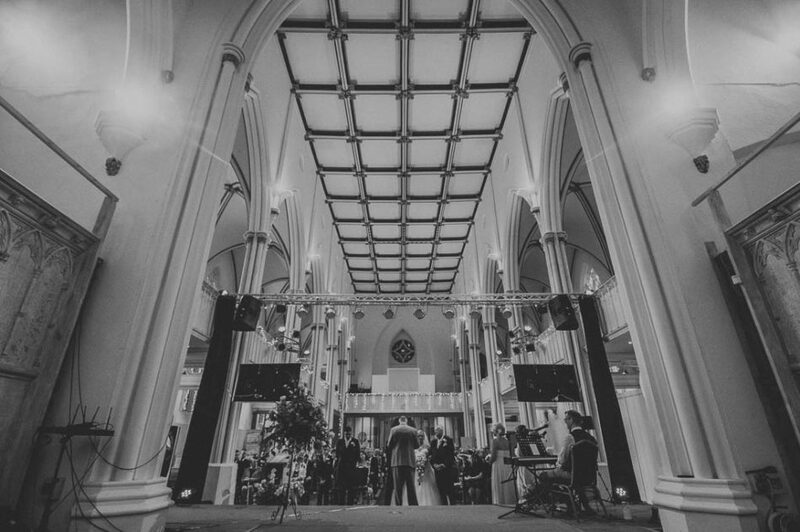 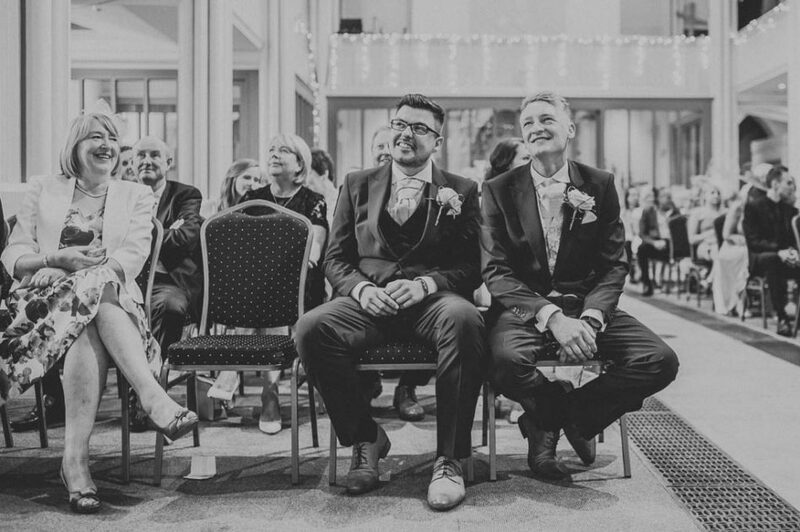 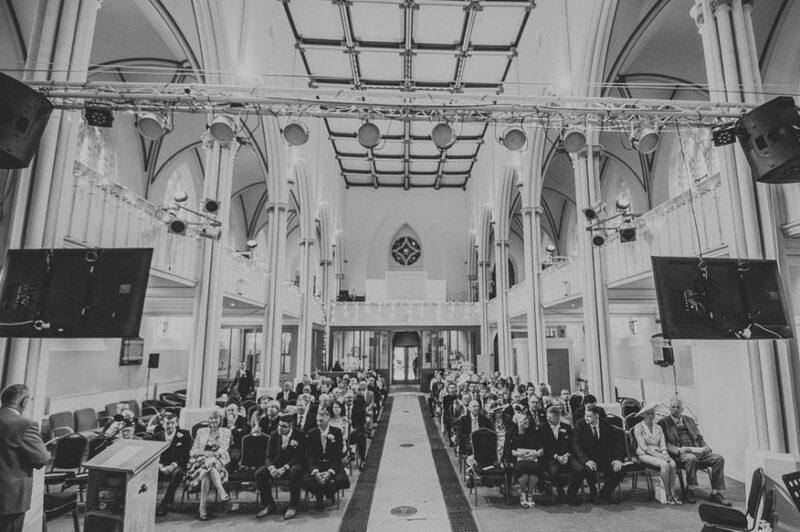 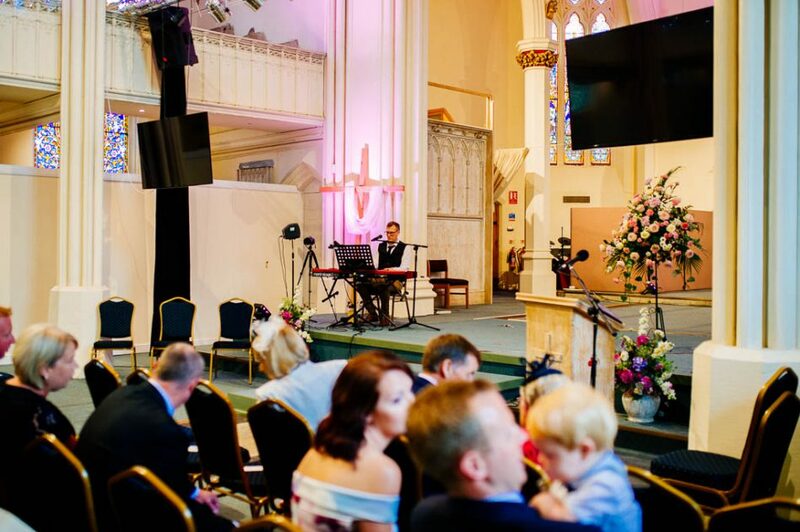 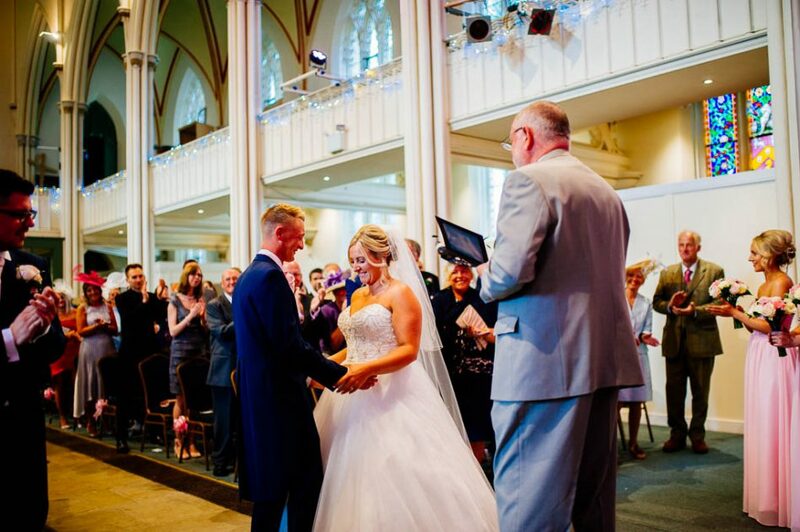 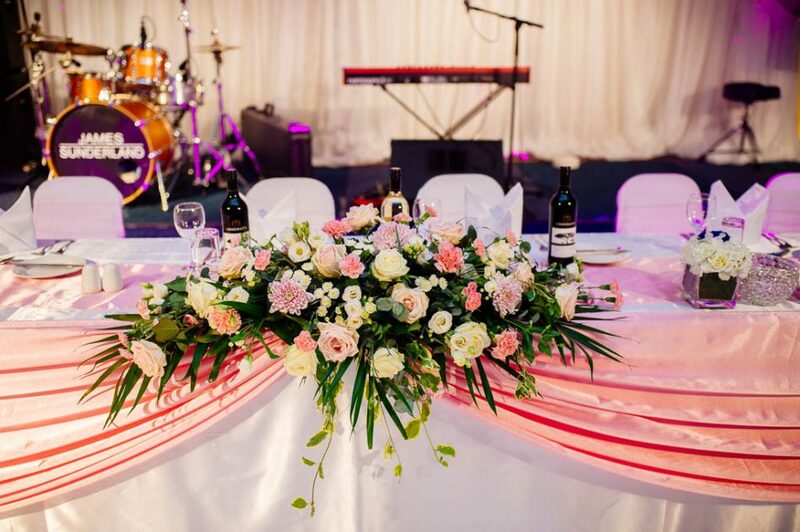 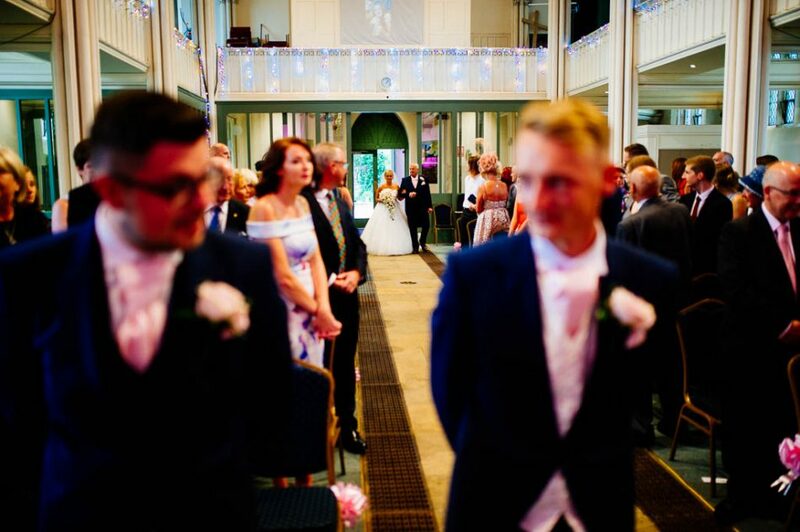 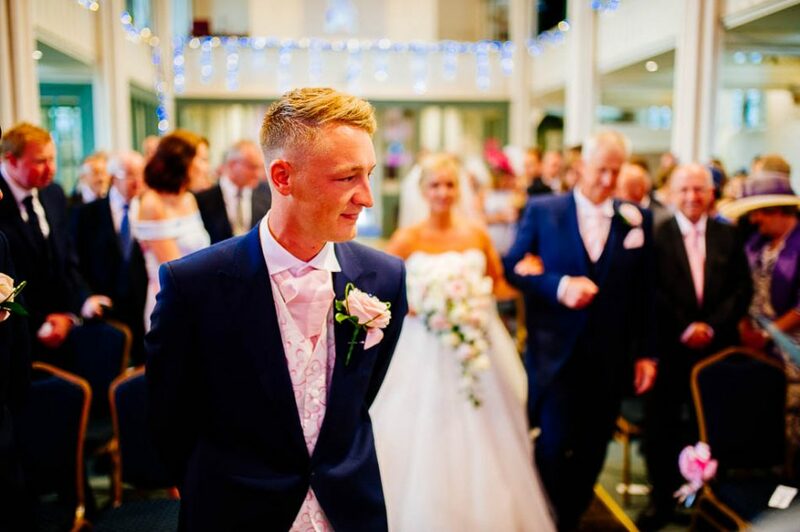 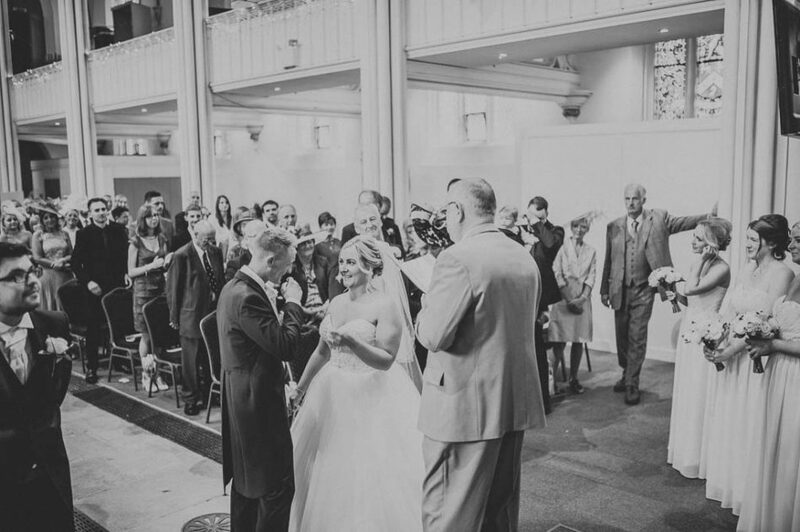 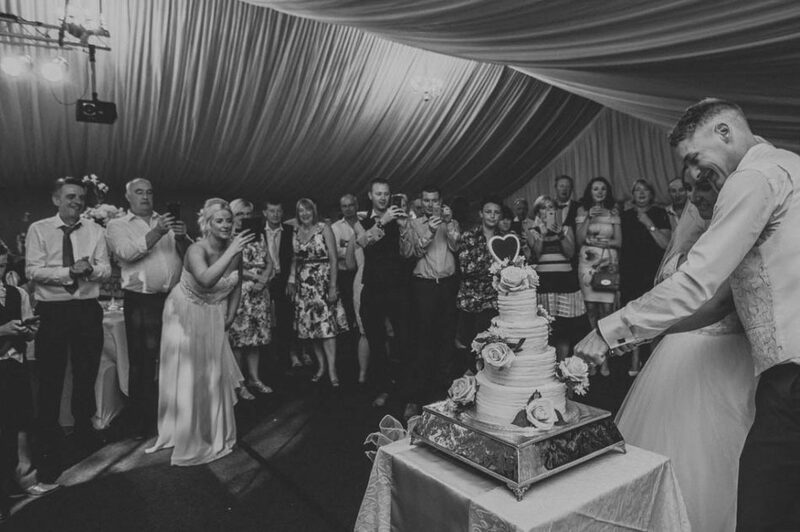 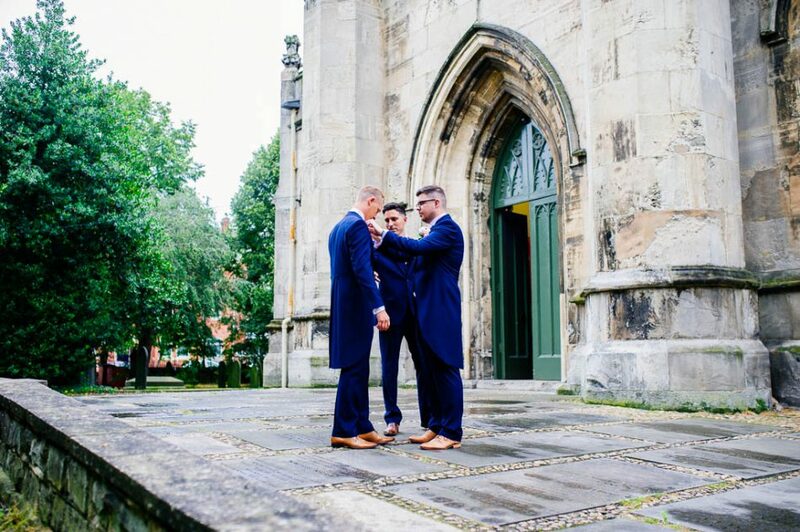 The ceremony at Christ Church was followed by a reception at the Doncaster Deaf Trust College which had been beautifully transformed into a wedding venue. 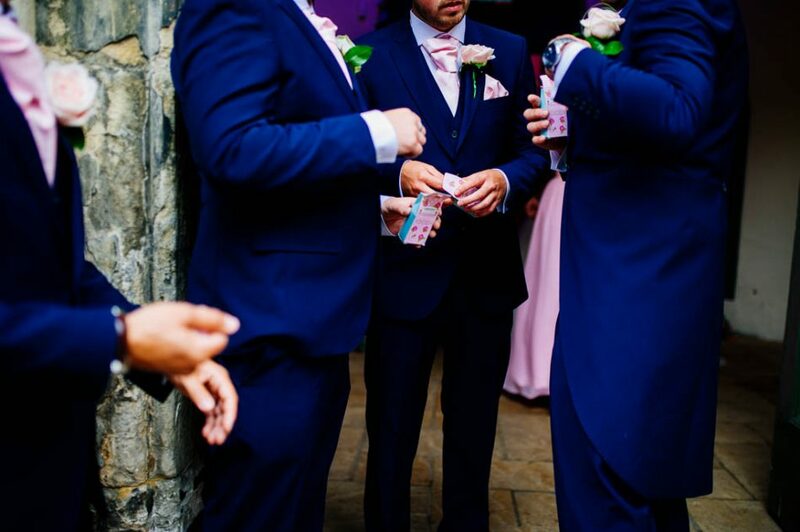 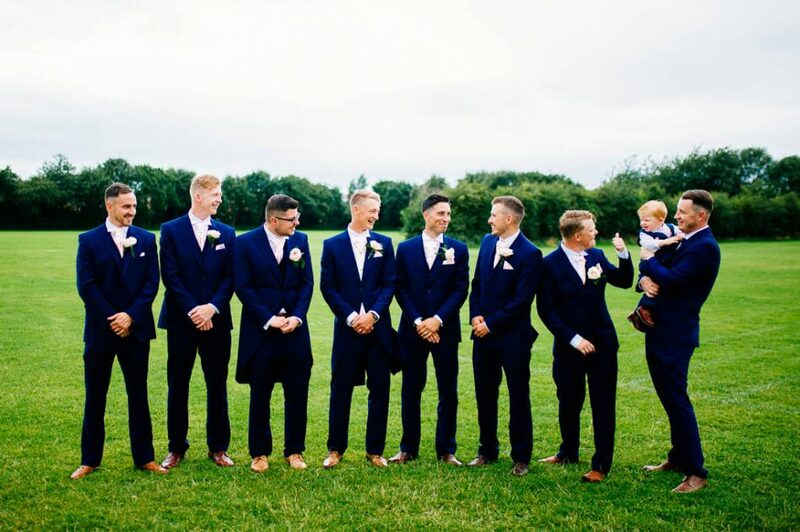 Rob’s side of the wedding party was filled with a large crew of family and friends looking handsome in deep blue suits. 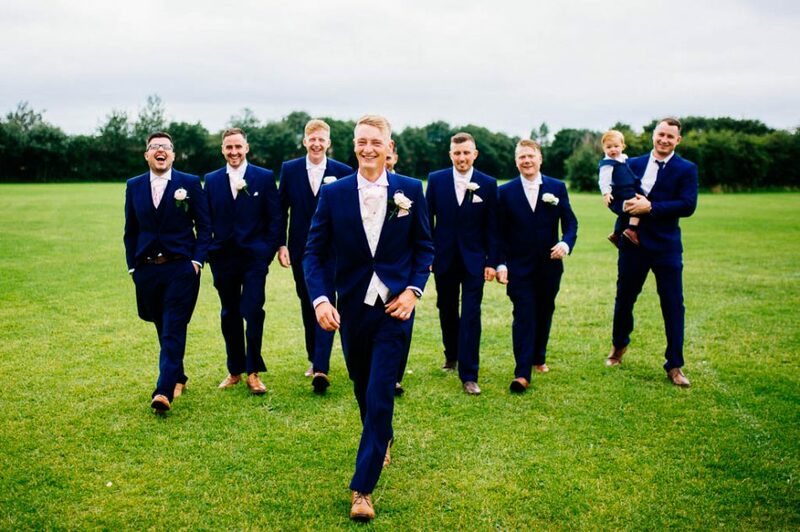 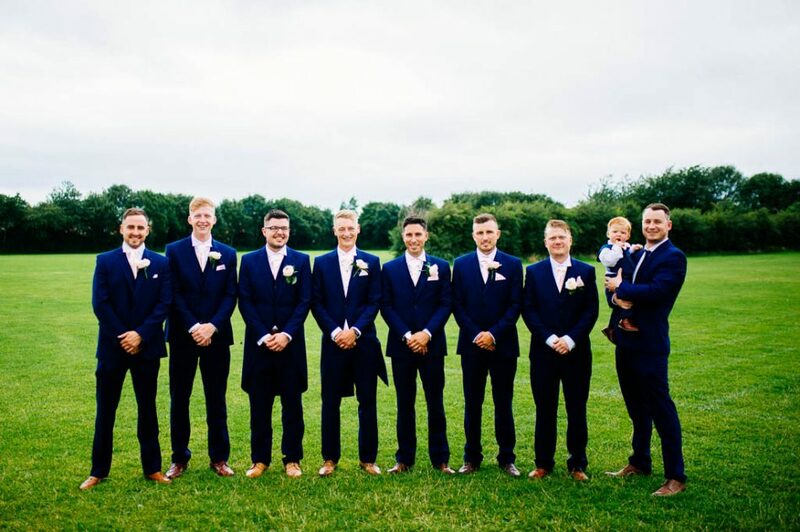 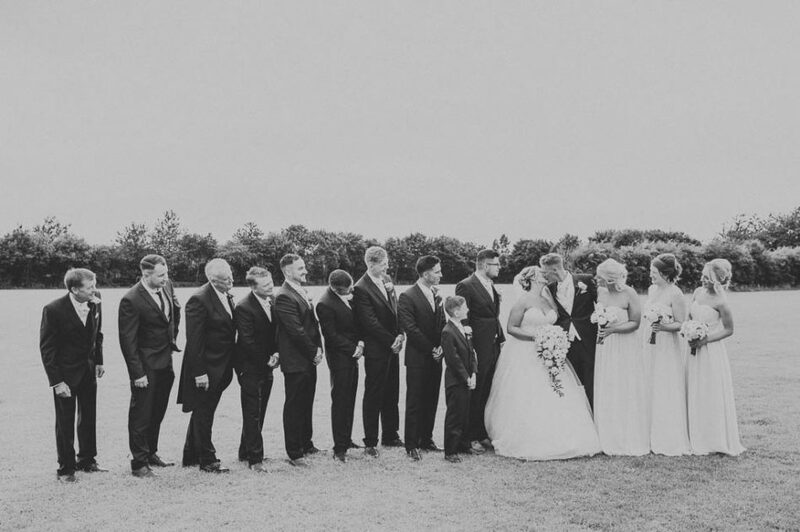 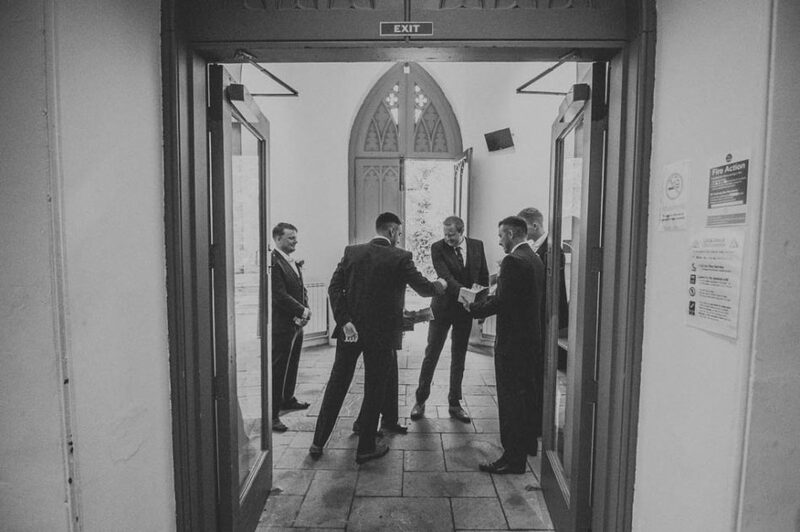 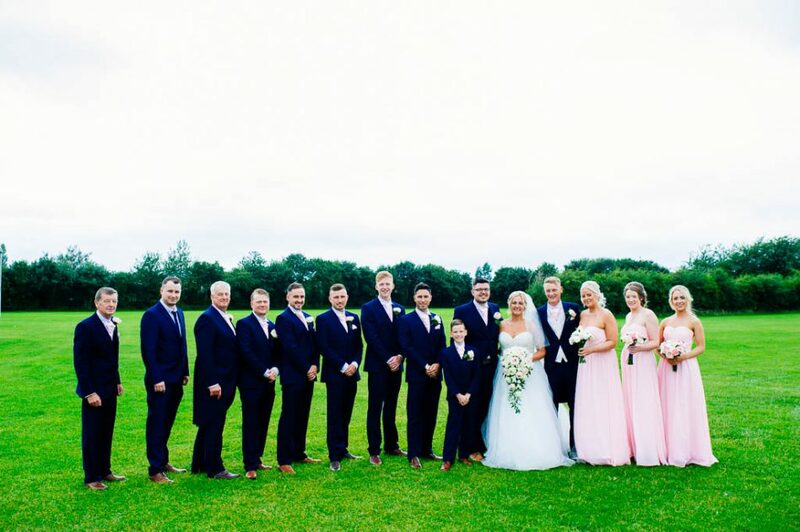 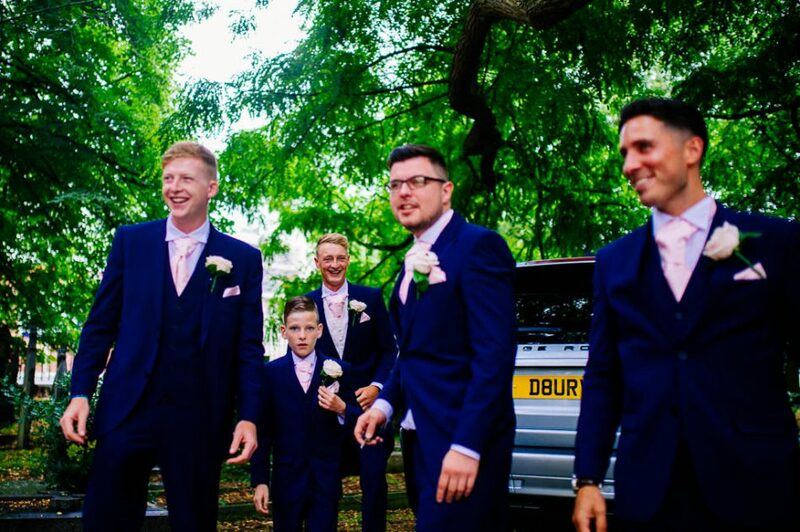 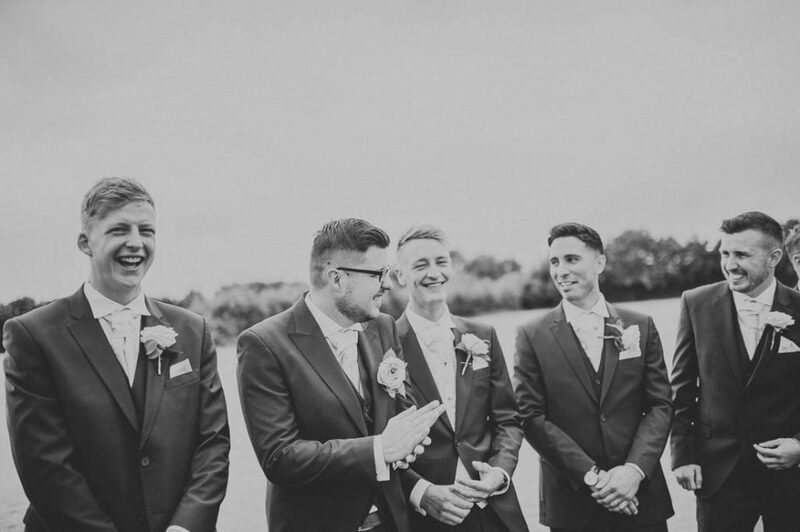 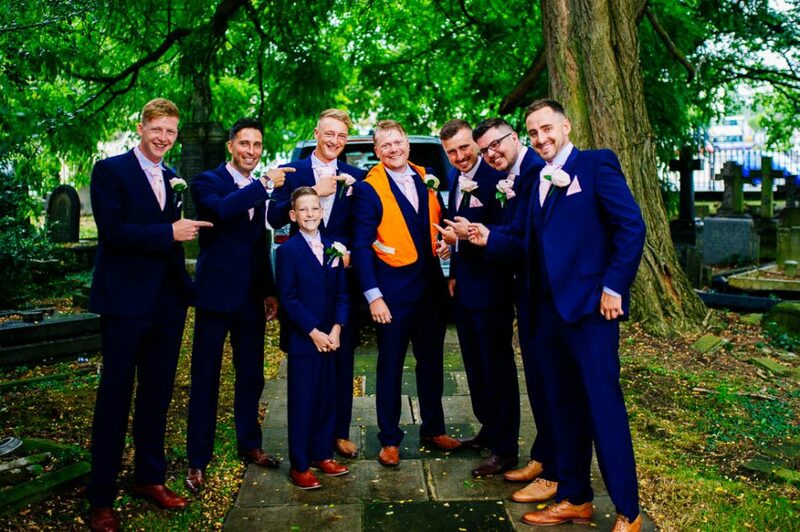 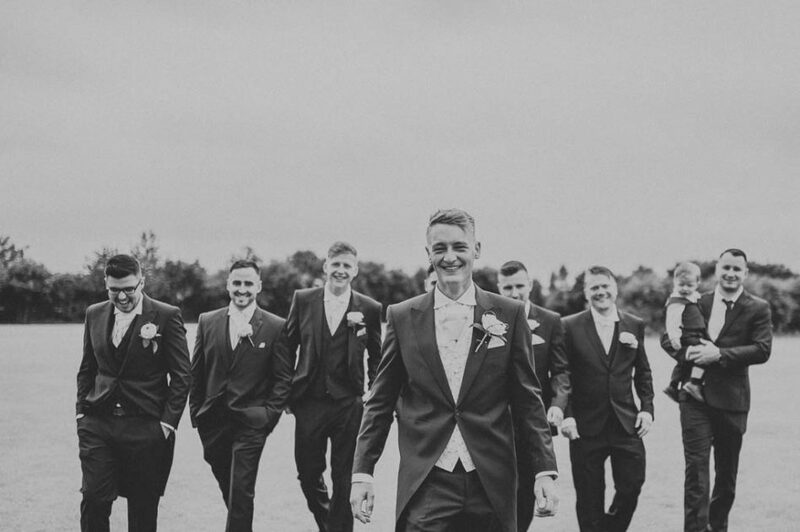 The dapper wedding party included Arthur and Charlie. 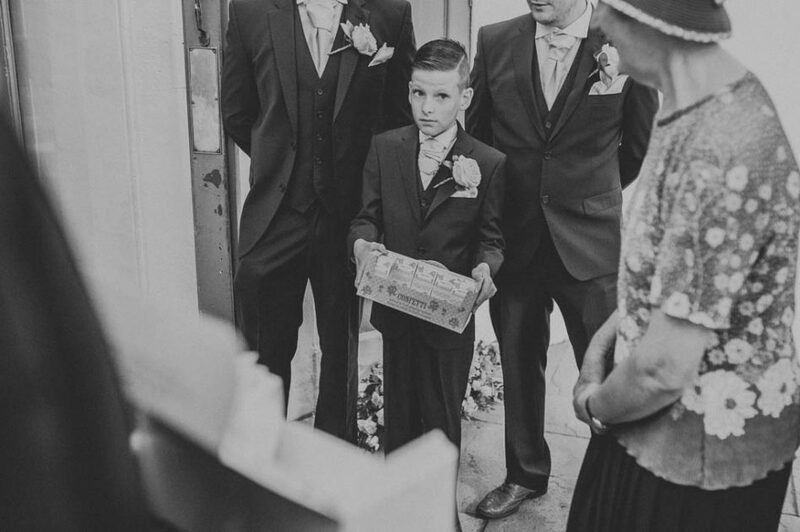 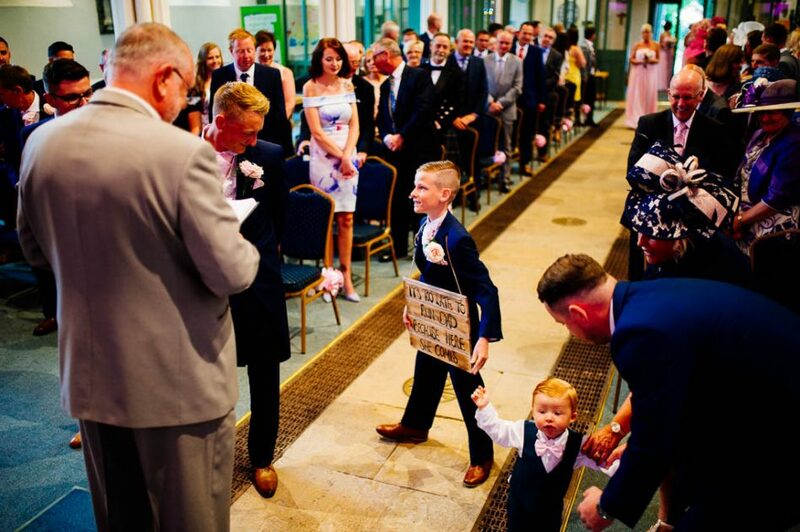 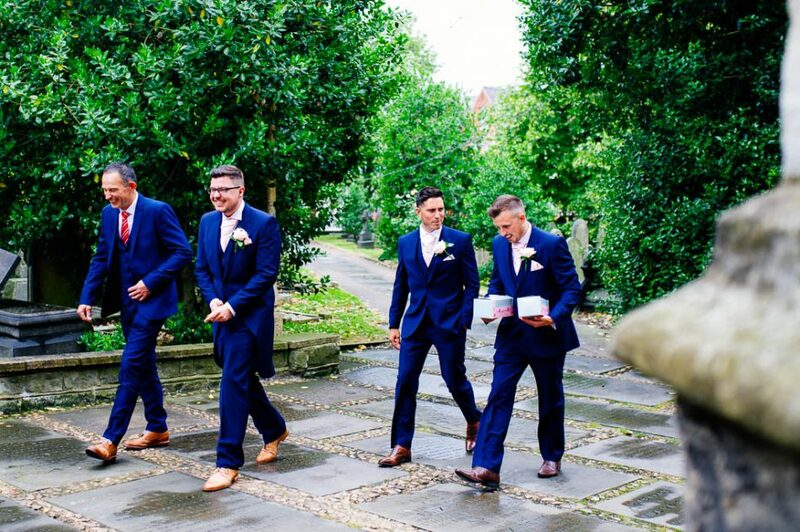 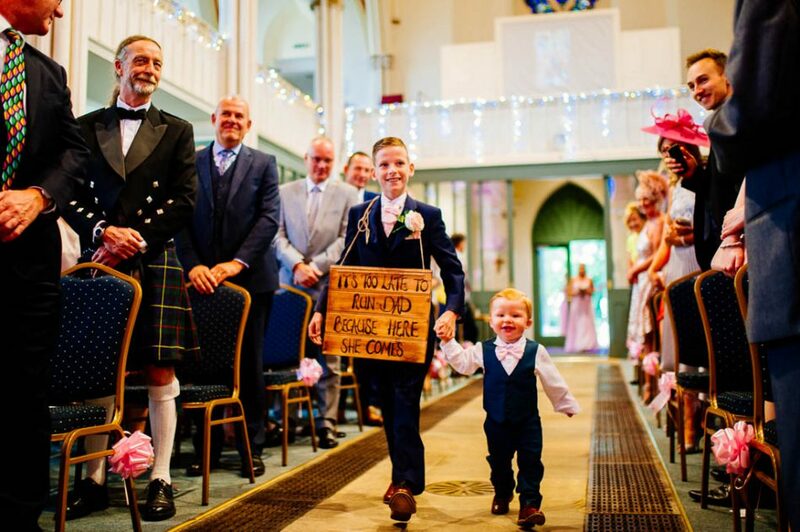 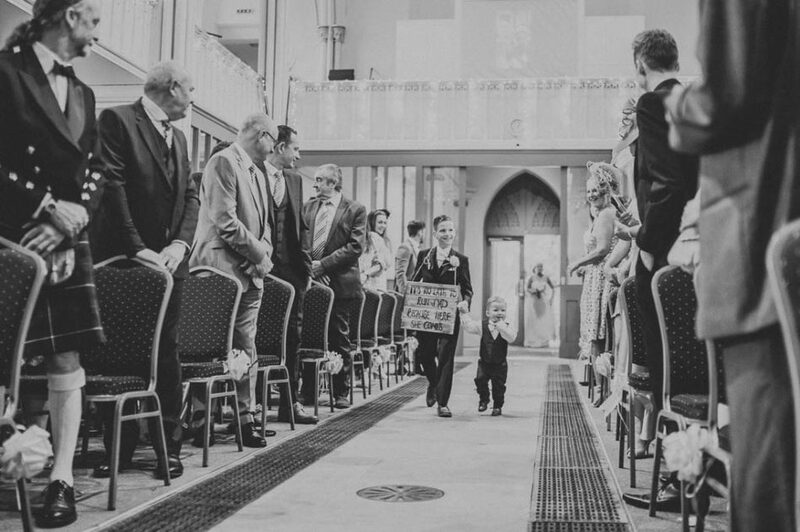 The boys came down the aisle together while Charlie carried the “It’s too late to run, Dad” sign with a charming grin. 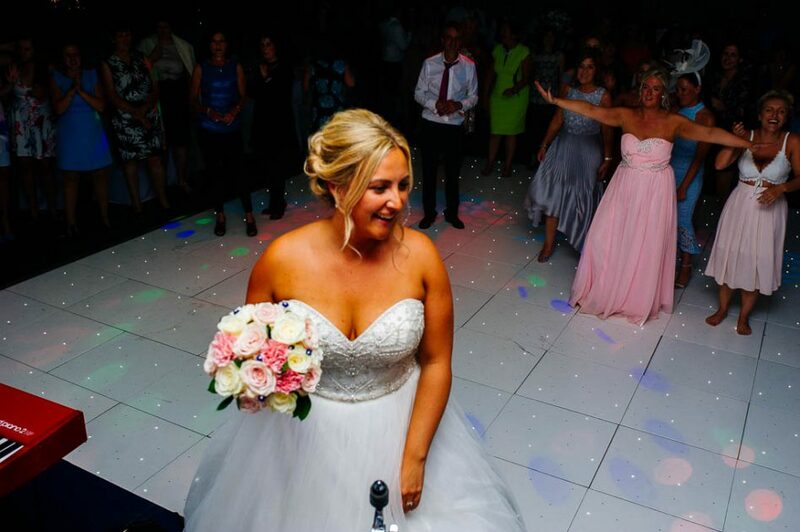 Lisa was, in true fairytale wedding fashion, reminiscent of Cinderella at the ball. 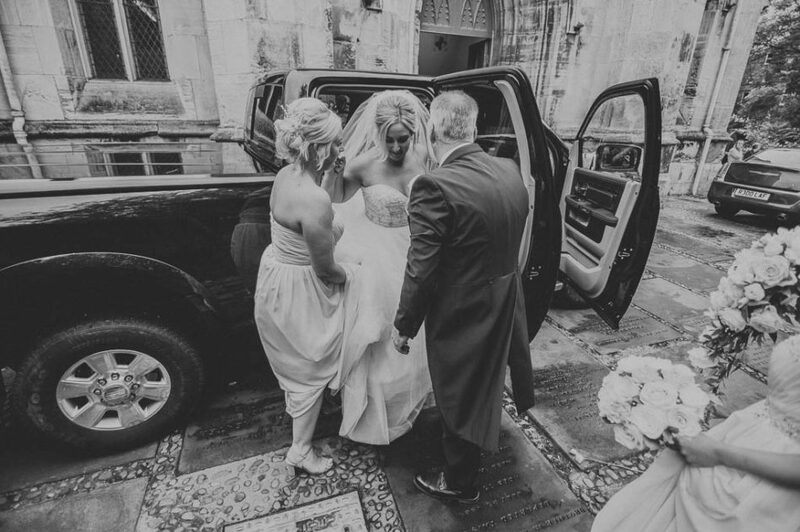 She looked joyful and elegant in a ballgown wedding dress with intricate beading on the bodice and lavish layers of flowing chiffon cascading to the floor. 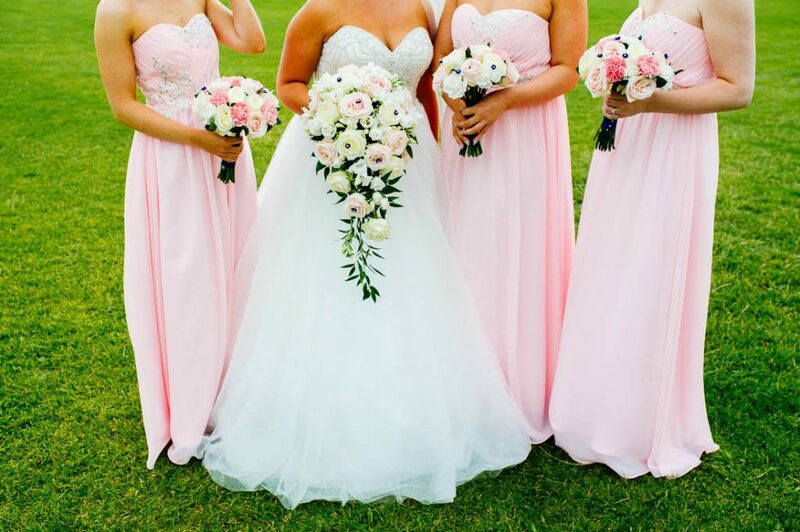 Carrying a waterfall bouquet created using several varieties of lush pink roses, she approached her husband-to-be at the alter with sweet anticipation. 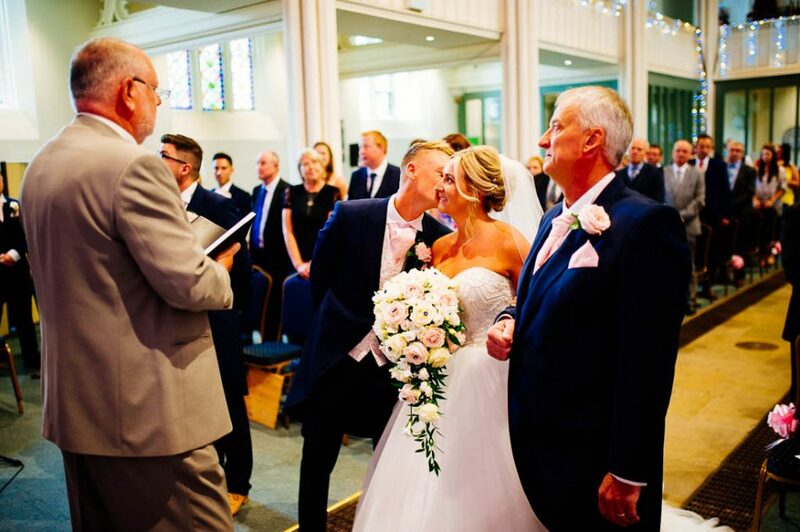 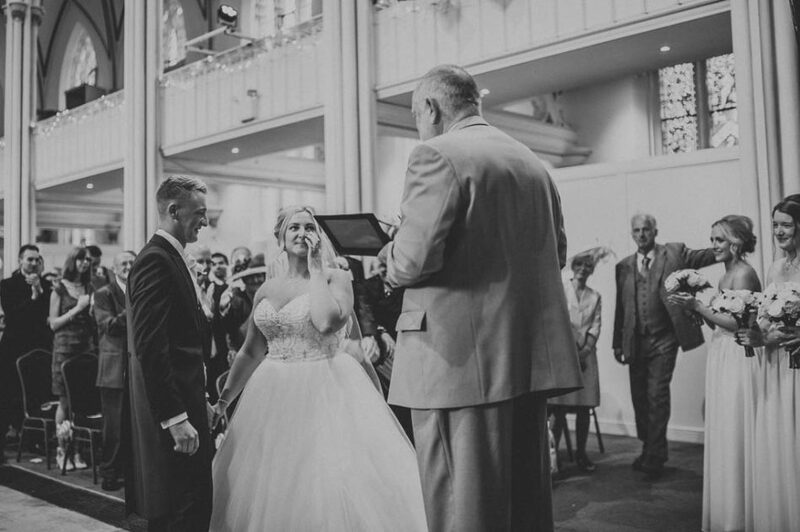 Rob’s expression upon seeing her for the first time was pure happiness, while her father passed her hand over to Rob with a proud and quiet love. 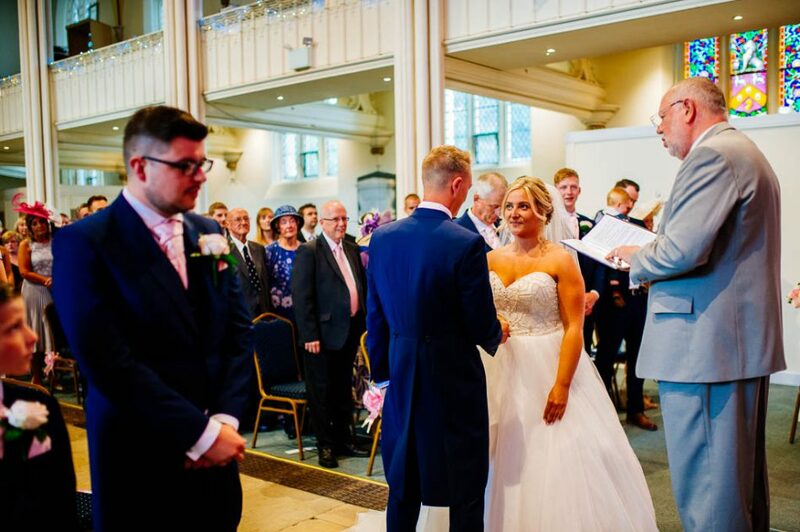 The ceremony was genuine, sentimental and truly heartfelt; there was a flurry of handkerchiefs seen at several moments throughout. 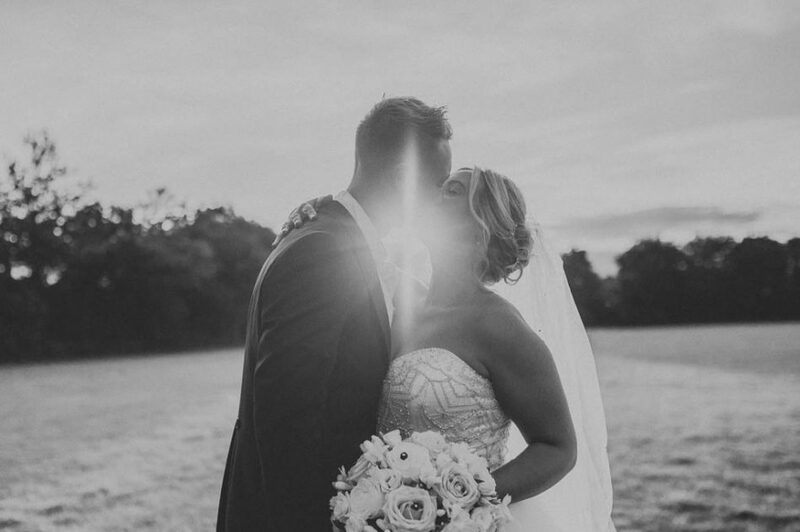 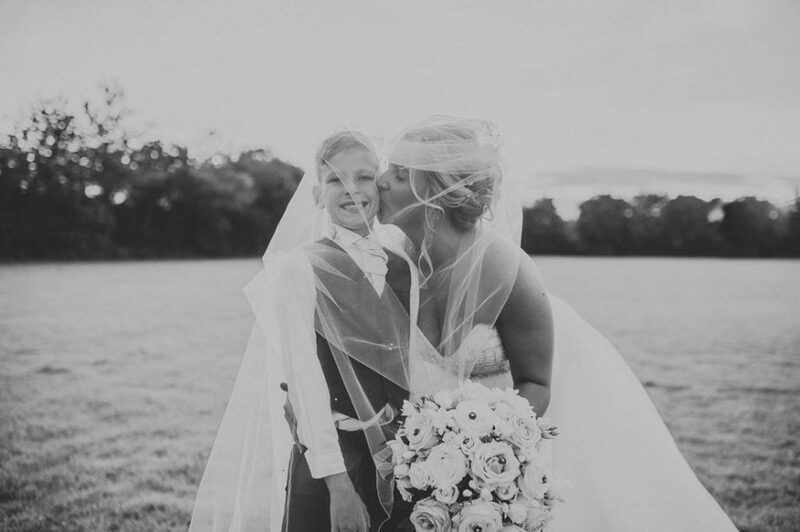 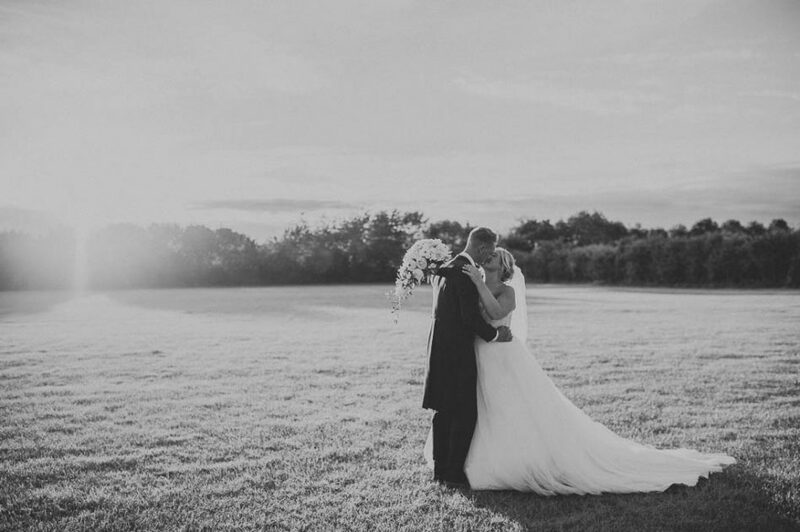 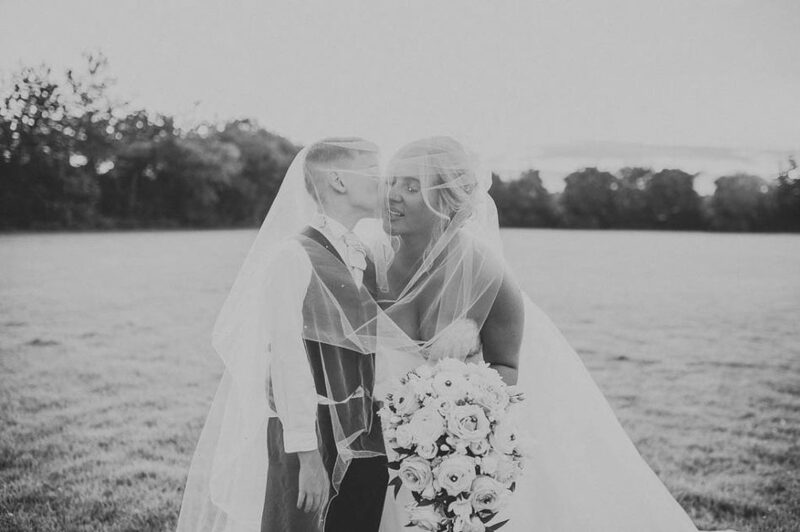 It felt like an explosion of love and excitement the moment they exchanged their first kiss as husband and wife! 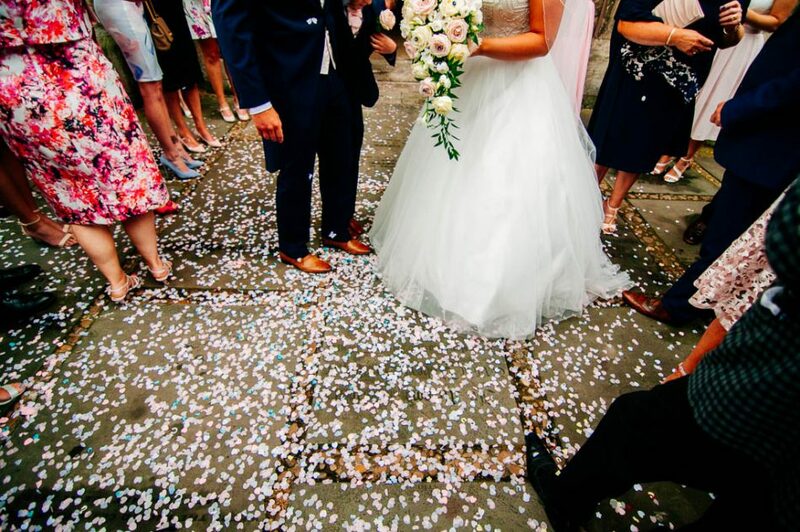 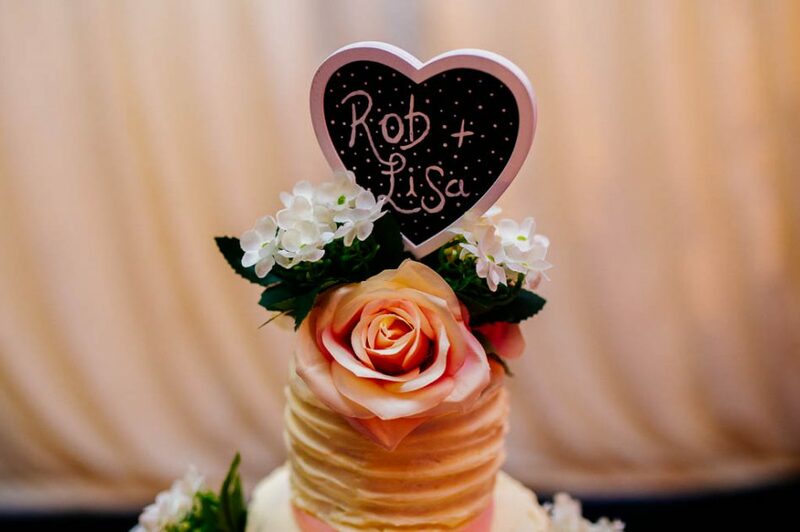 Rob and Lisa exited the church as man and wife into a joyful cloud of colorful, heart-shaped confetti as the guests cheered and applauded, before being whisked off to the reception in a hired car. 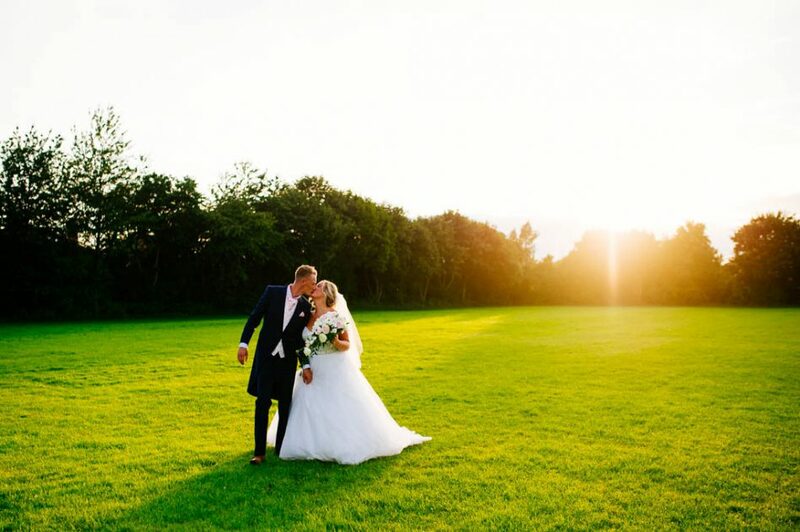 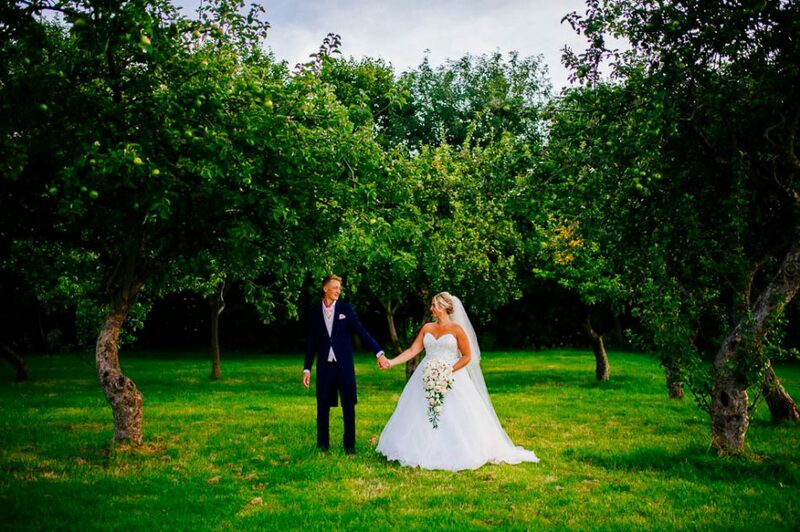 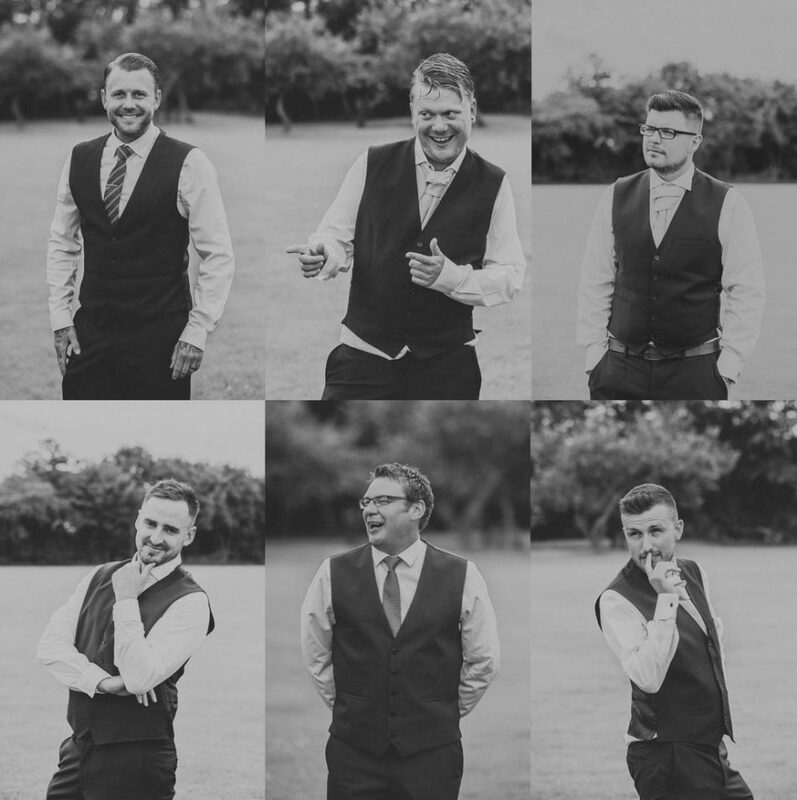 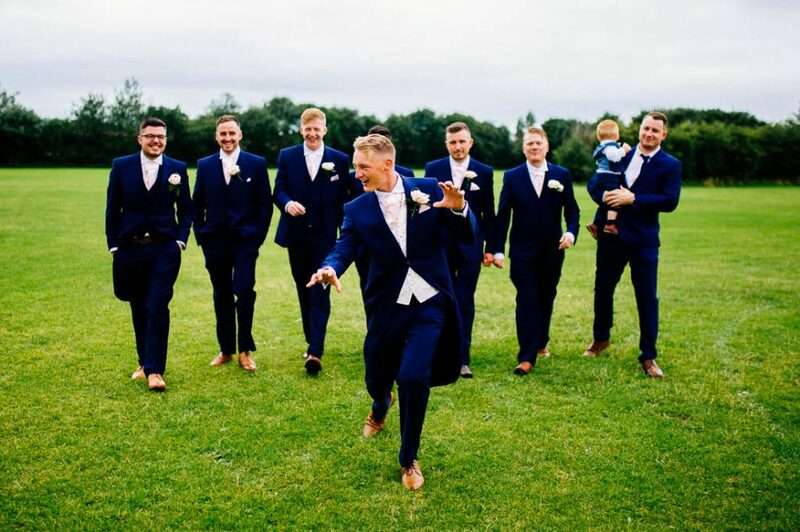 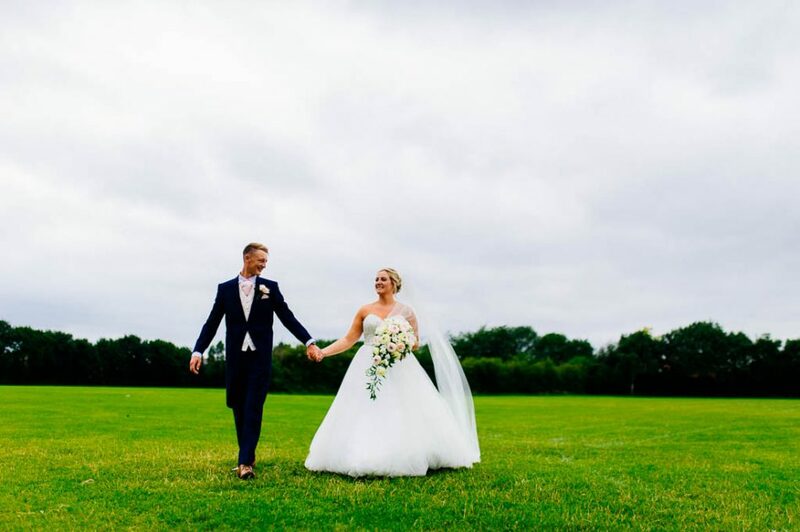 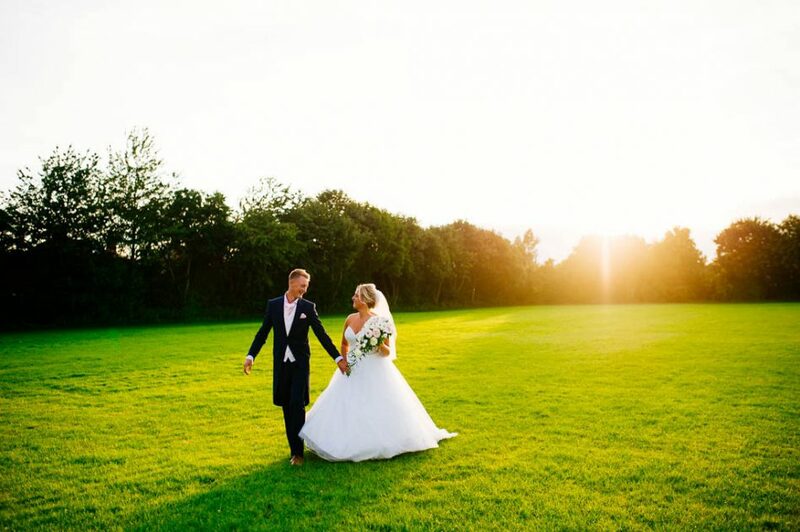 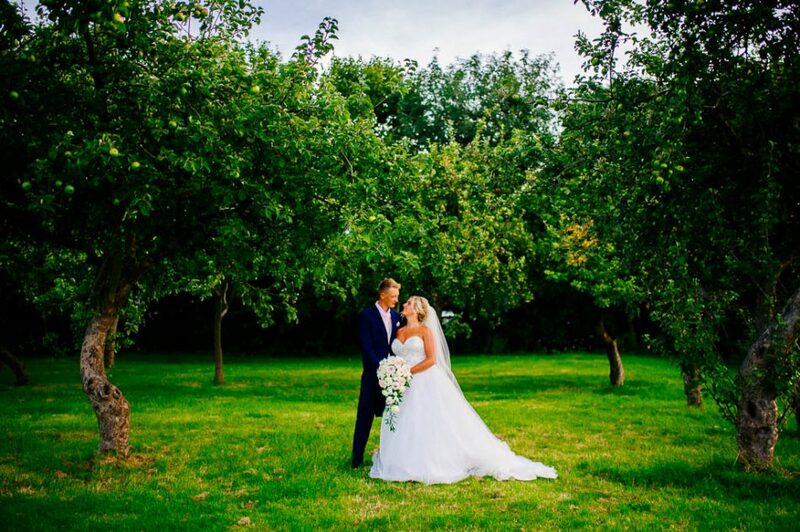 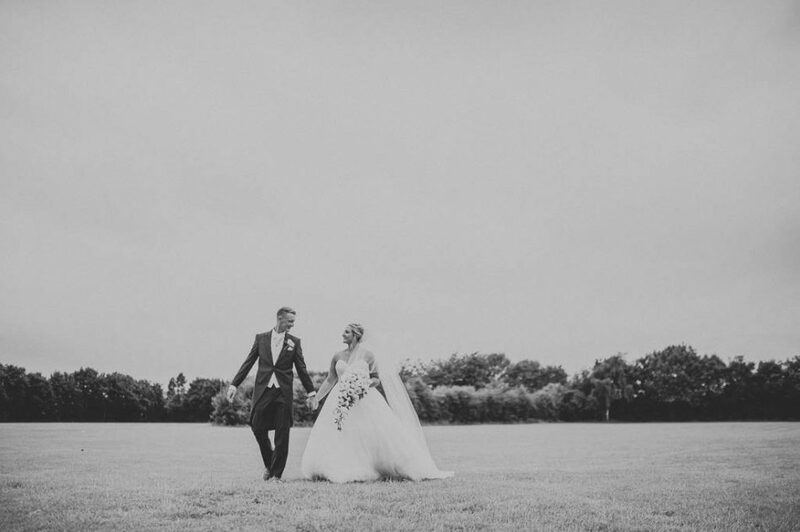 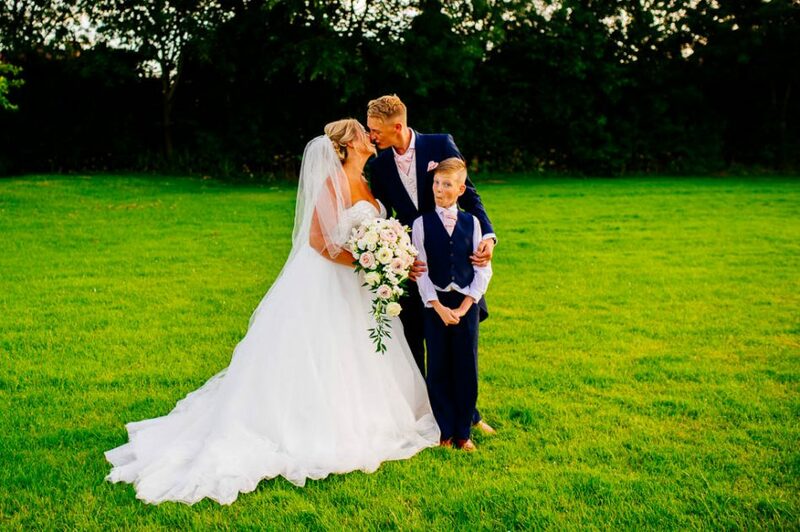 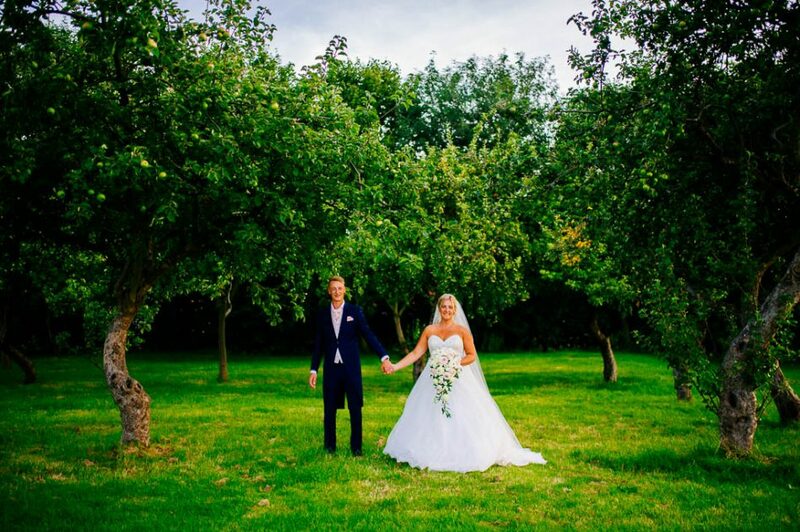 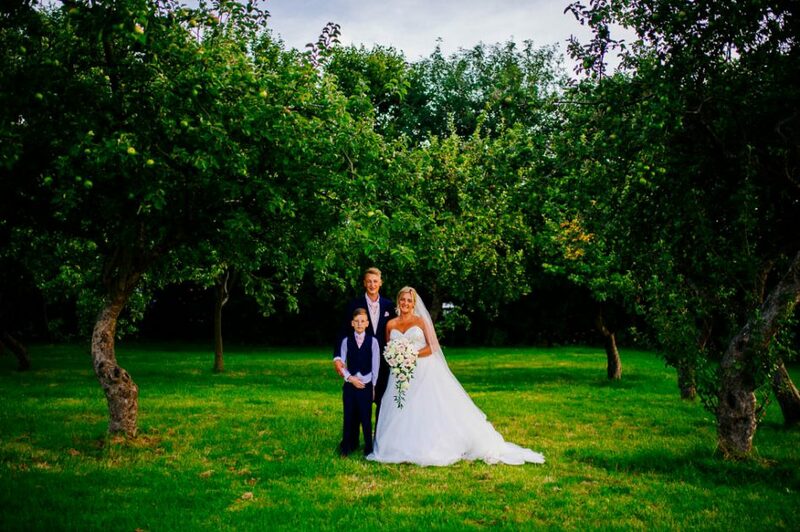 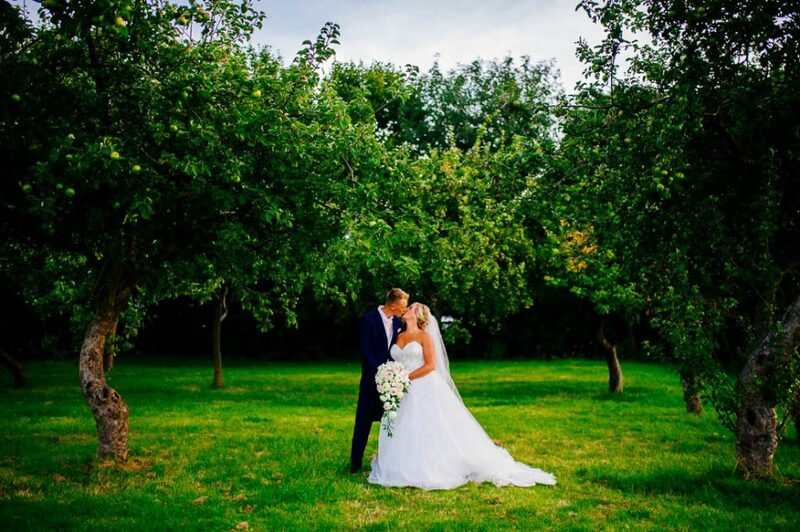 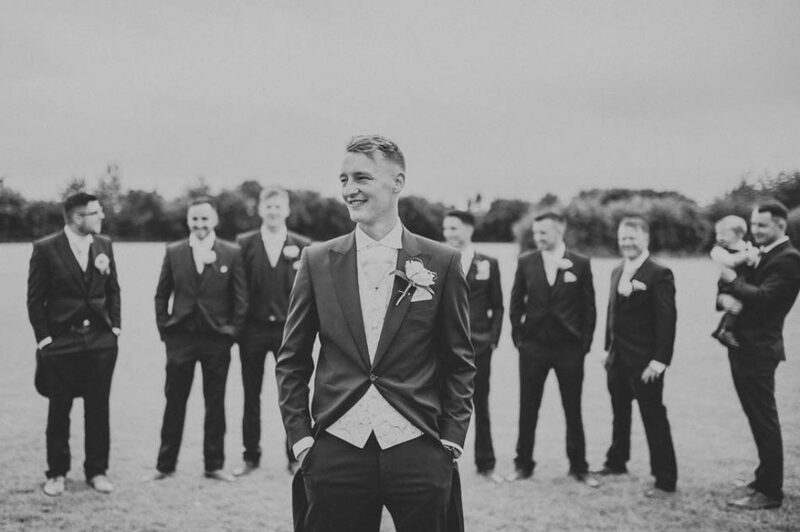 Before the reception, we took some lovely pictures with the bride and groom as well as the entire wedding party in both an orchard as well as a football pitch at the back of the wedding venue. 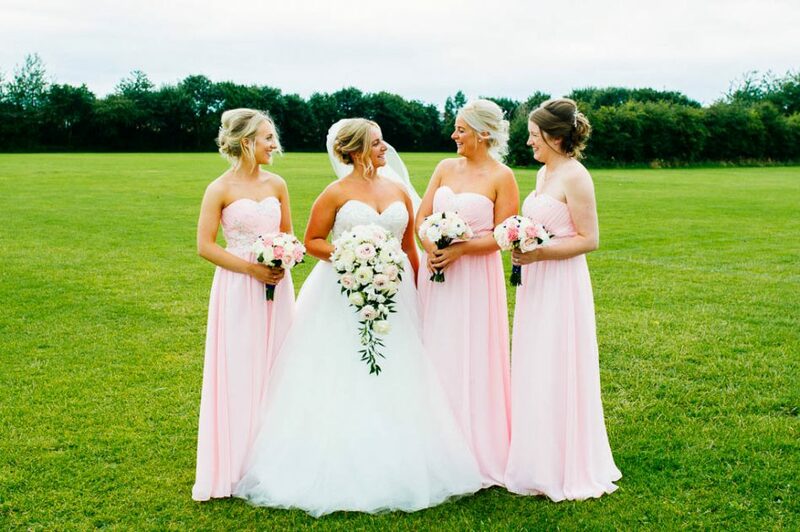 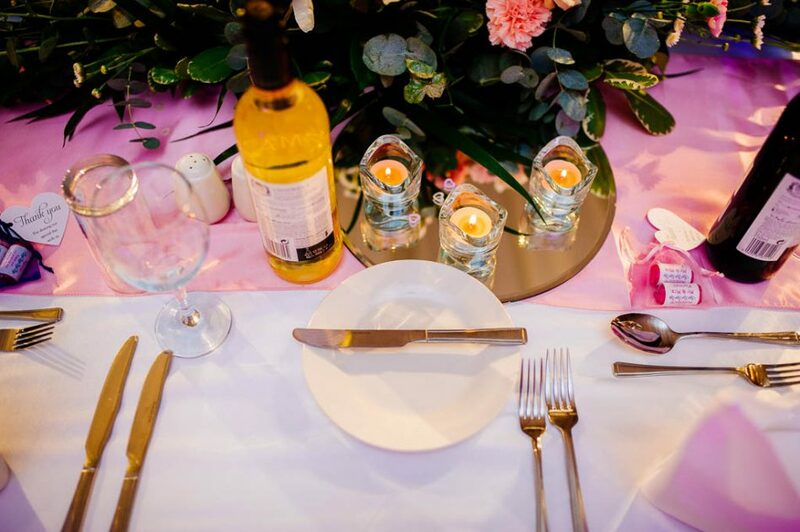 Lisa was accompanied by three of her closest lovely ladies wearing blush pink with sparkling accents, echoing the lush pink tones of the wedding colors. 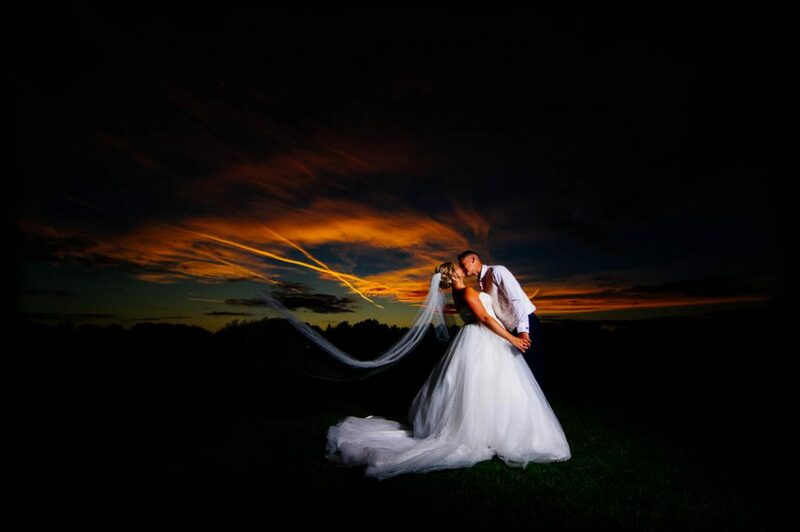 Capturing their beauty was incredibly easy, obviously! 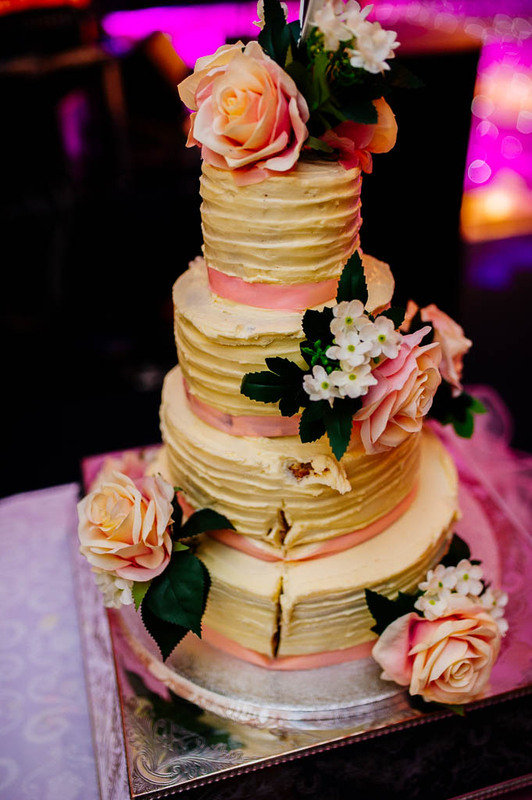 The reception was gorgeously decorated in various shades of pink and gold, including beautiful touches like the lovely seating chart, overflowing floral centerpieces and lighted letters spelling out “Love.” Highlights of the night included Charlie sharing a prepared speech during the toasts, and the lovely, emotion-filled father-daughter dance. 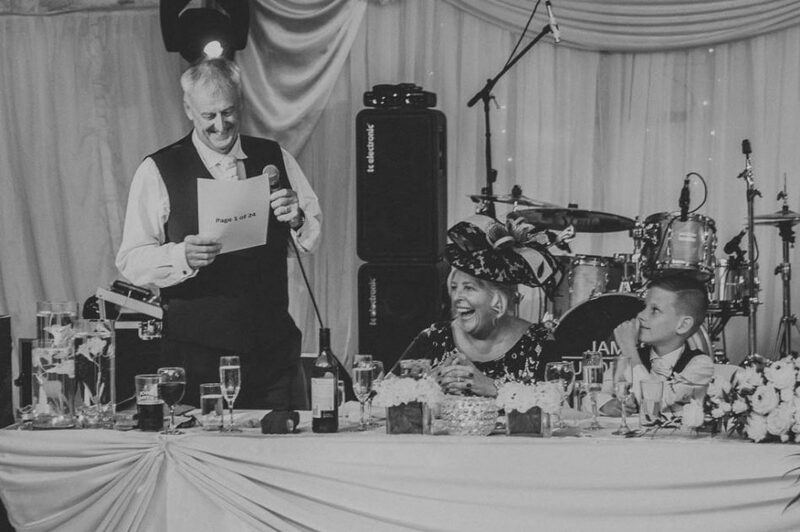 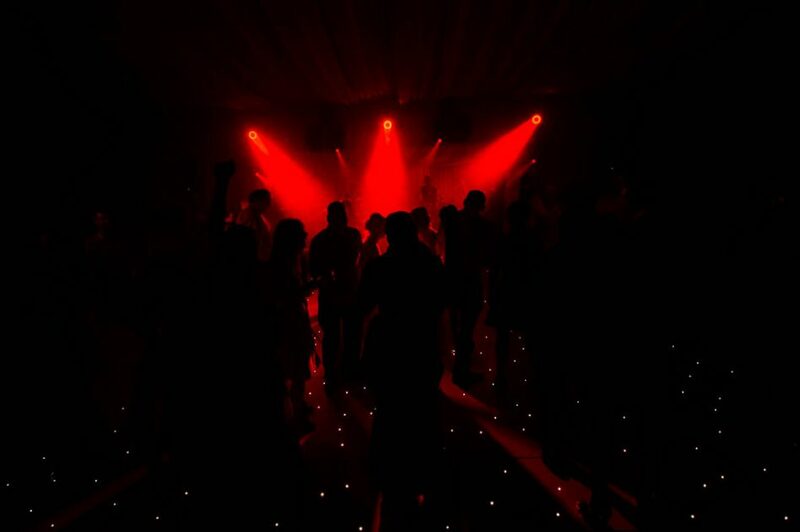 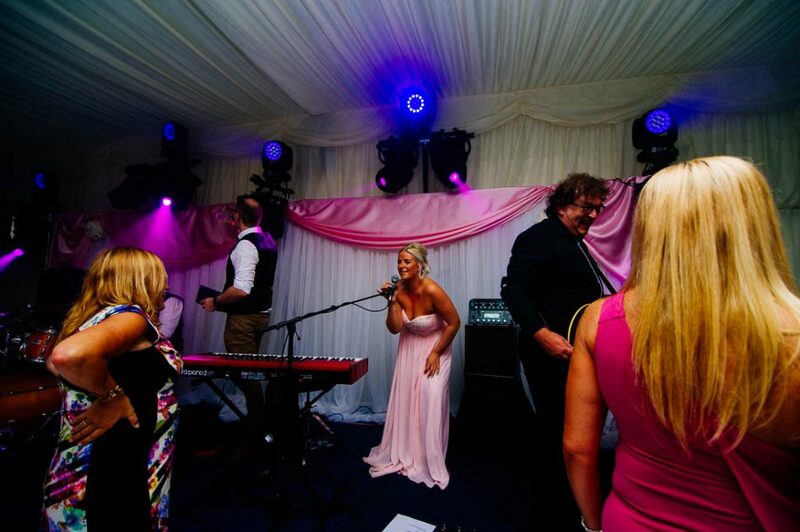 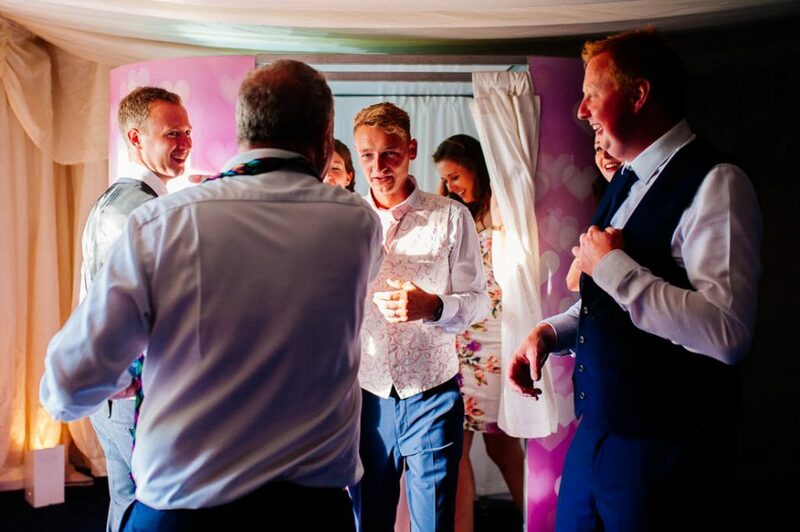 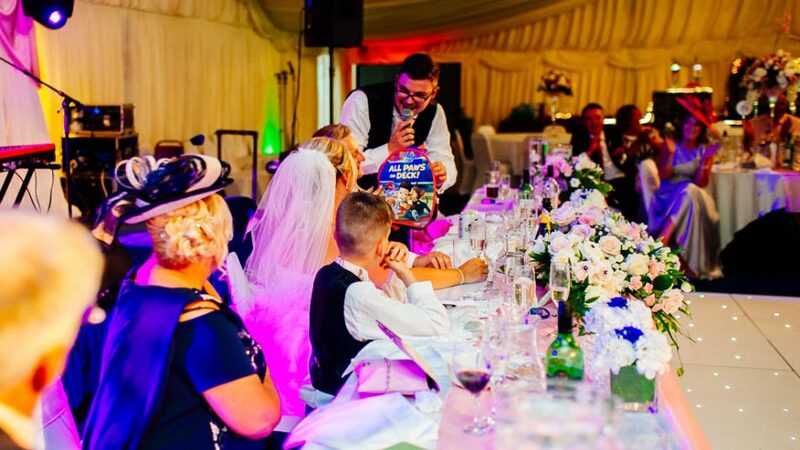 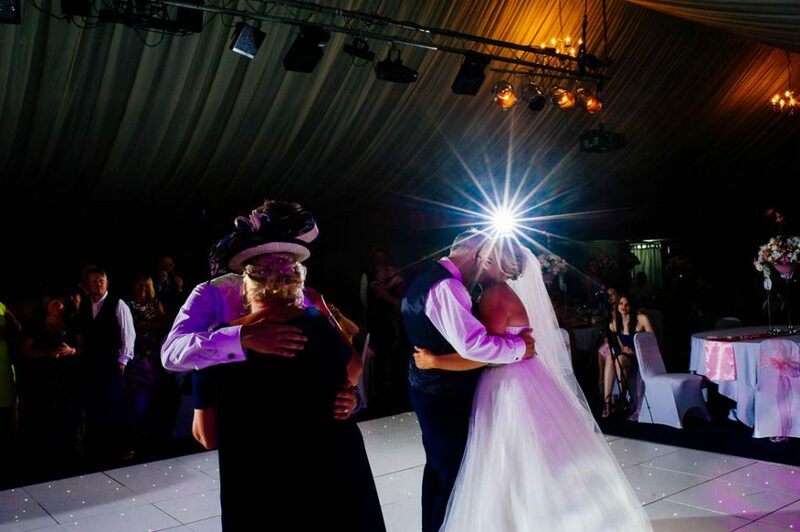 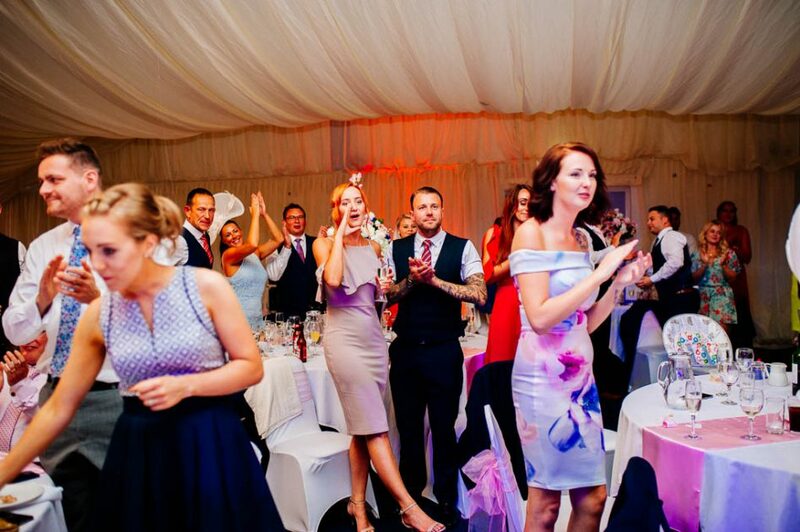 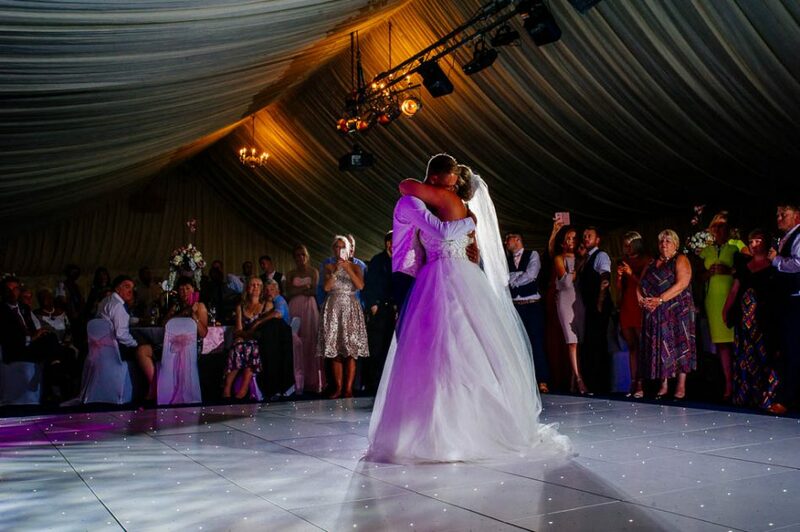 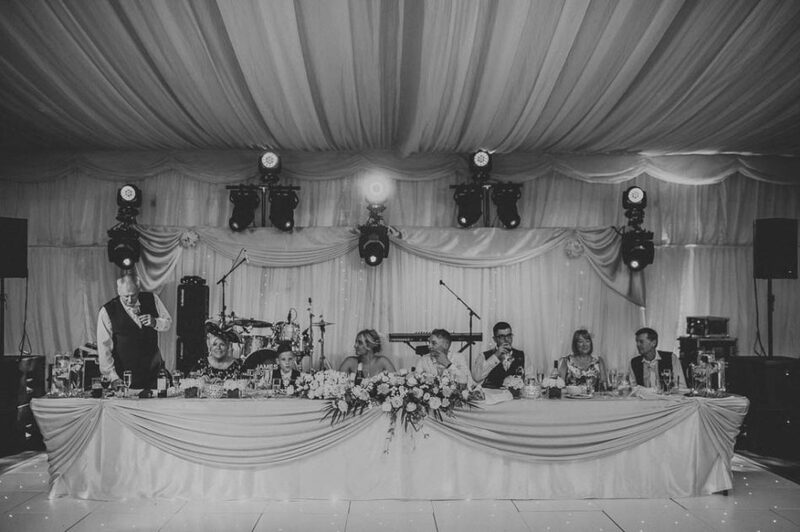 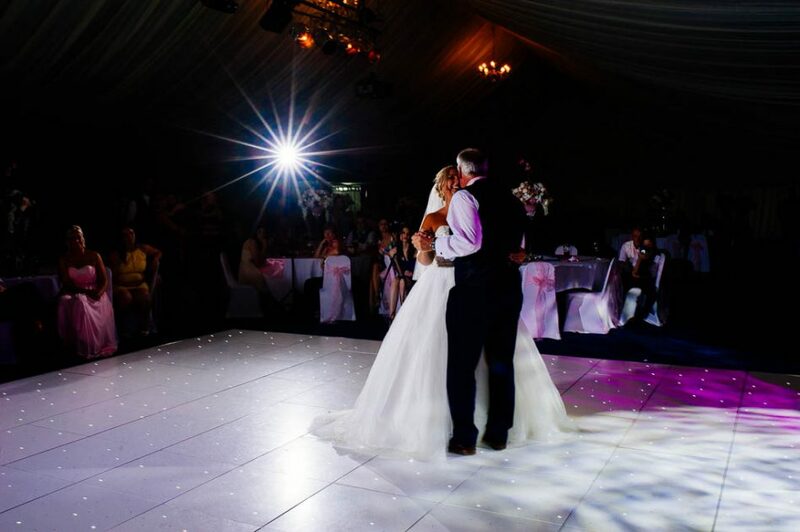 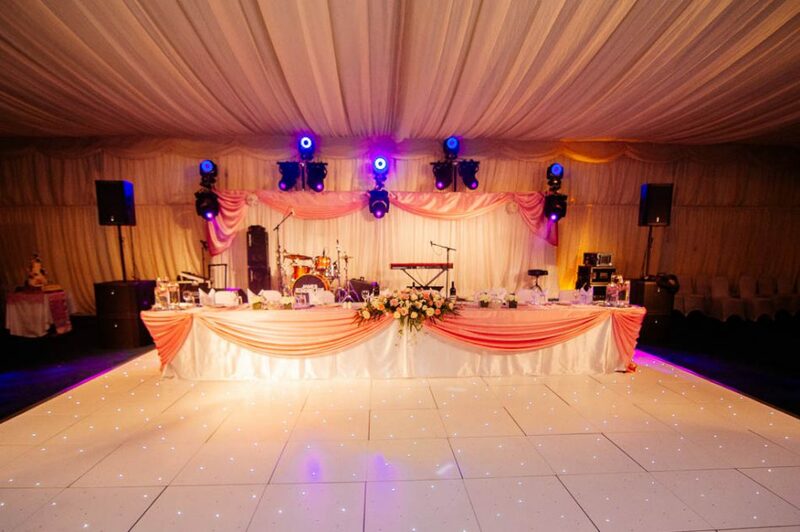 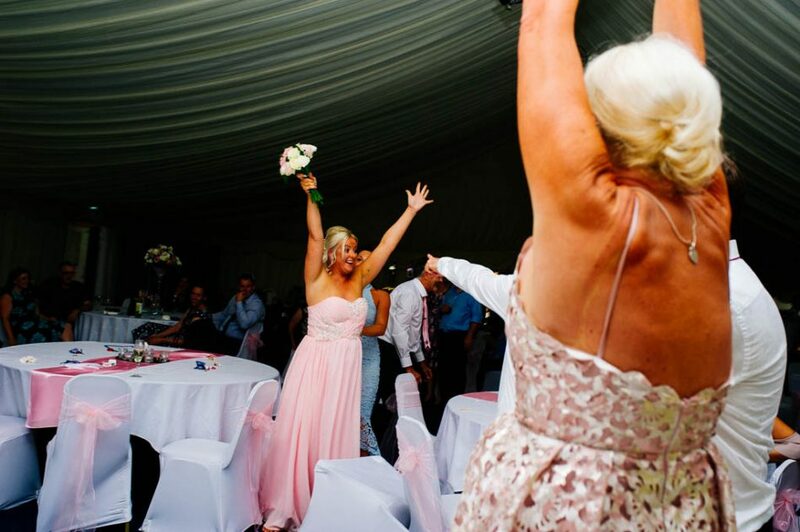 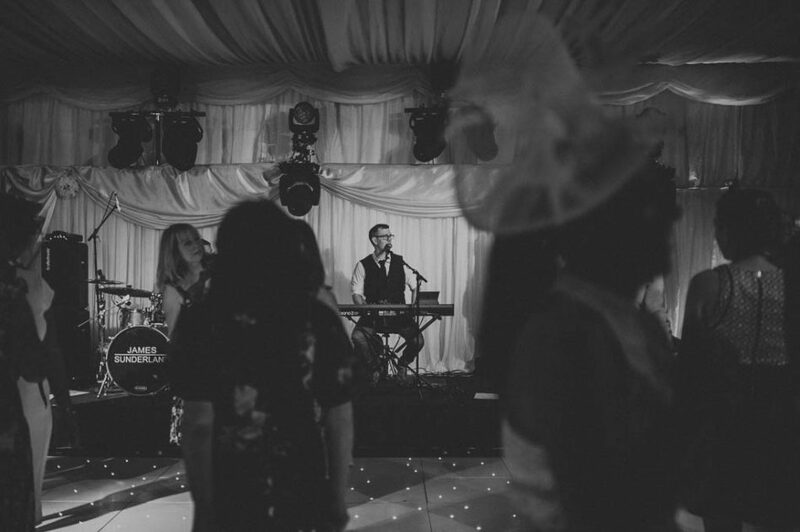 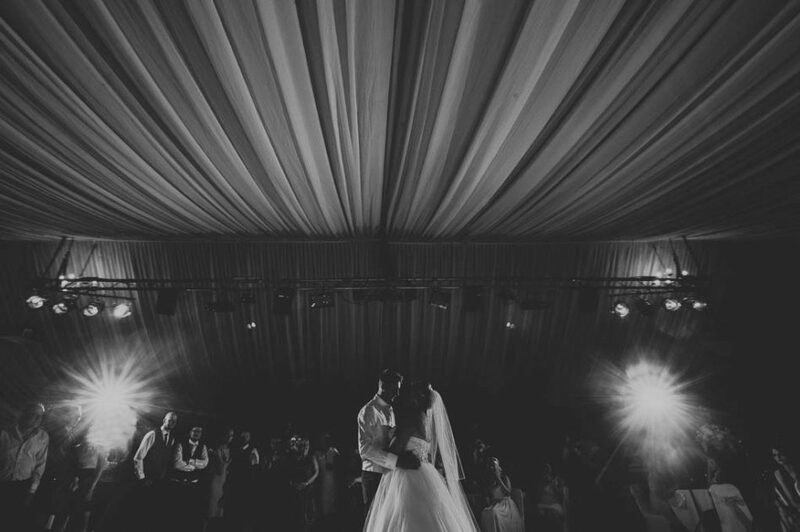 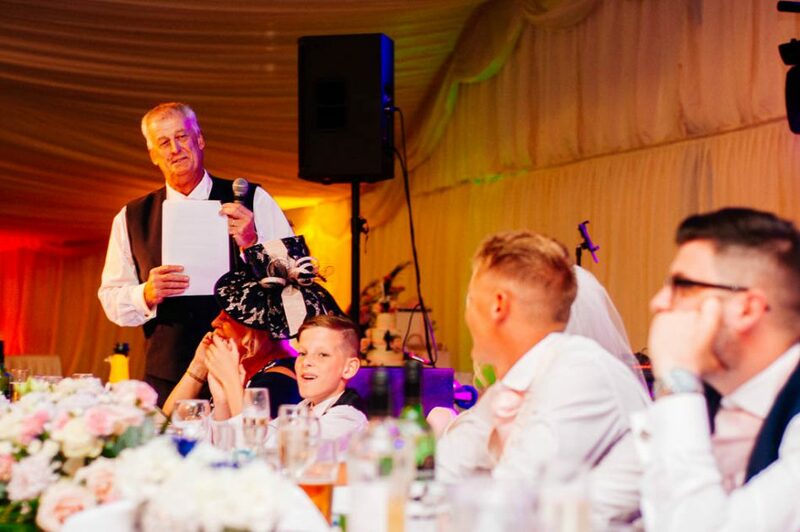 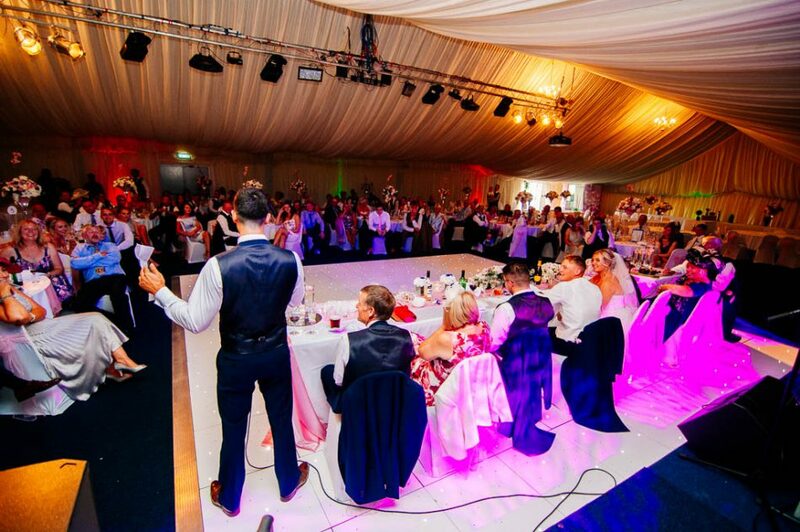 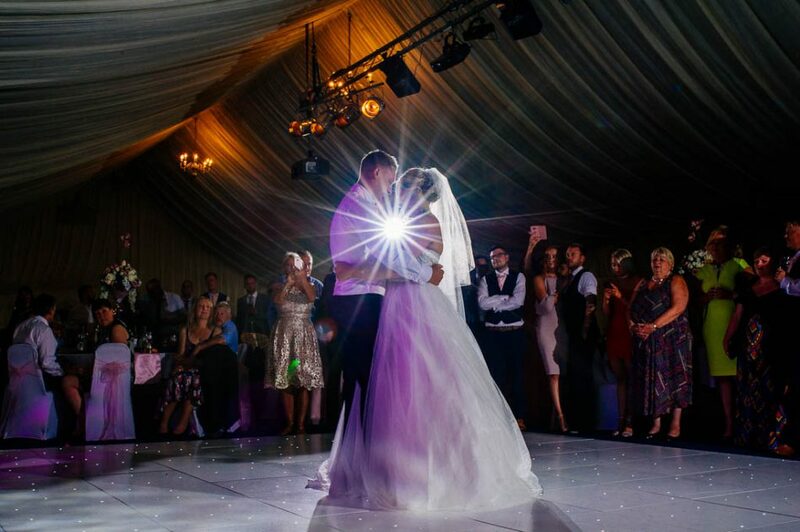 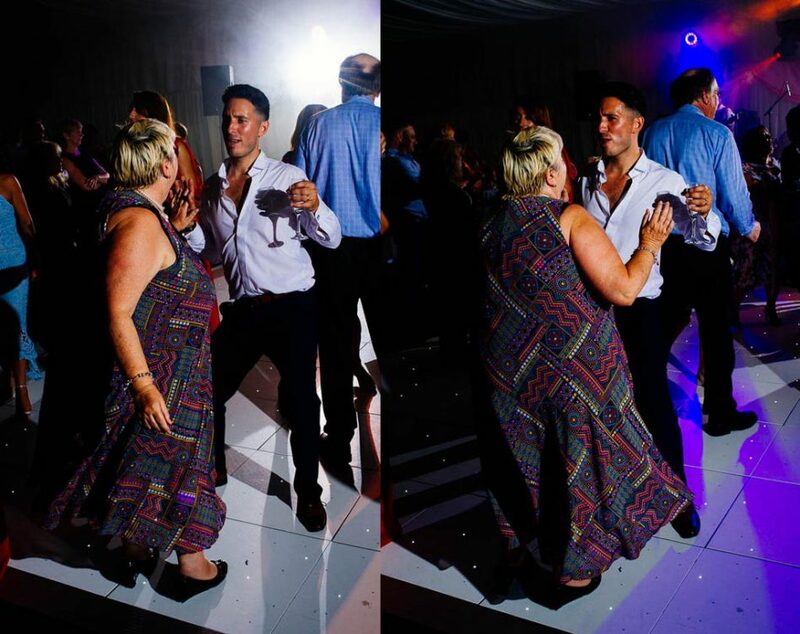 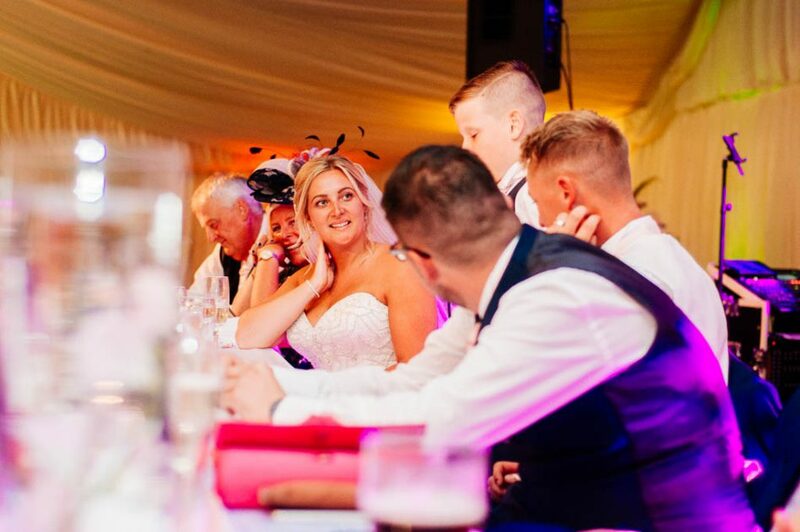 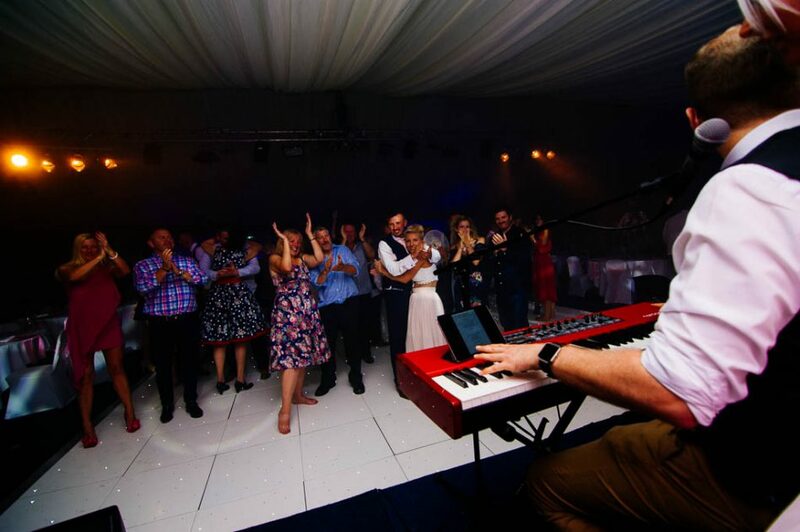 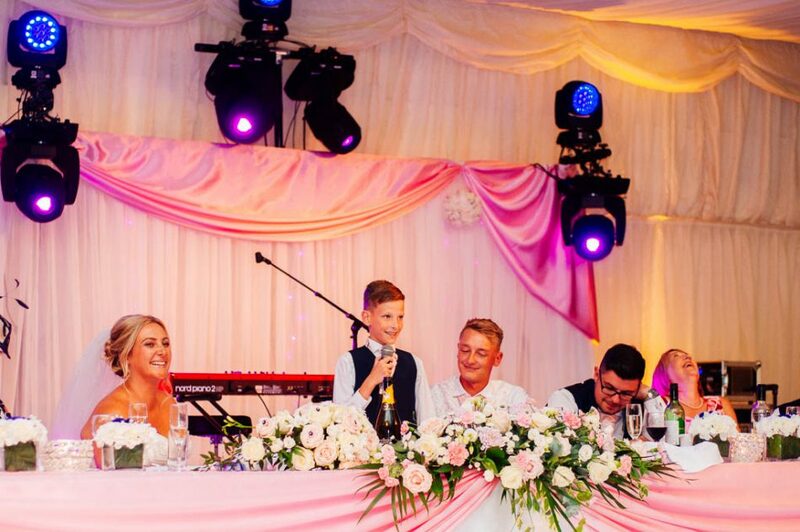 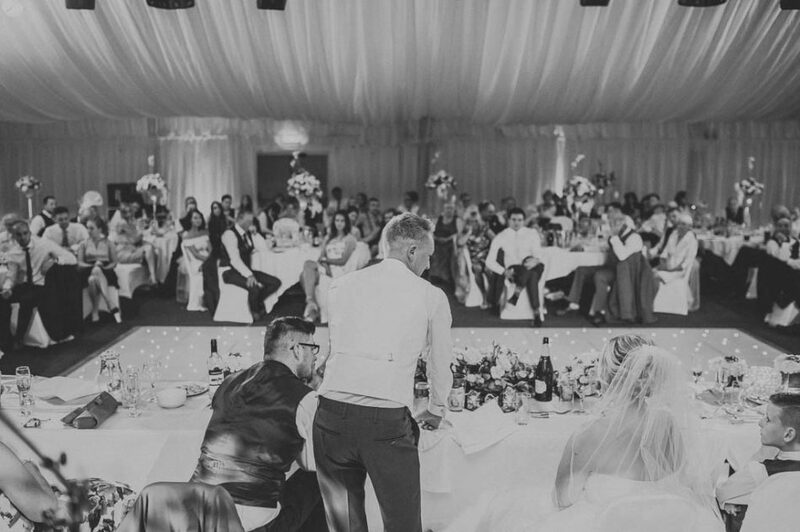 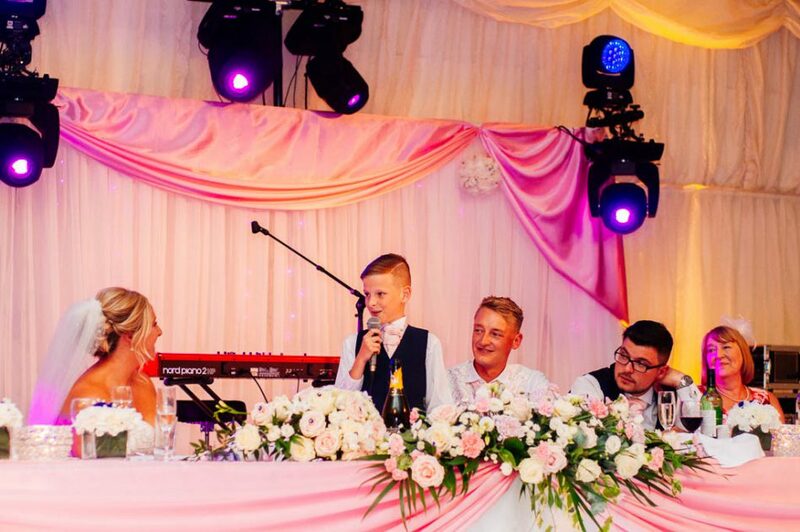 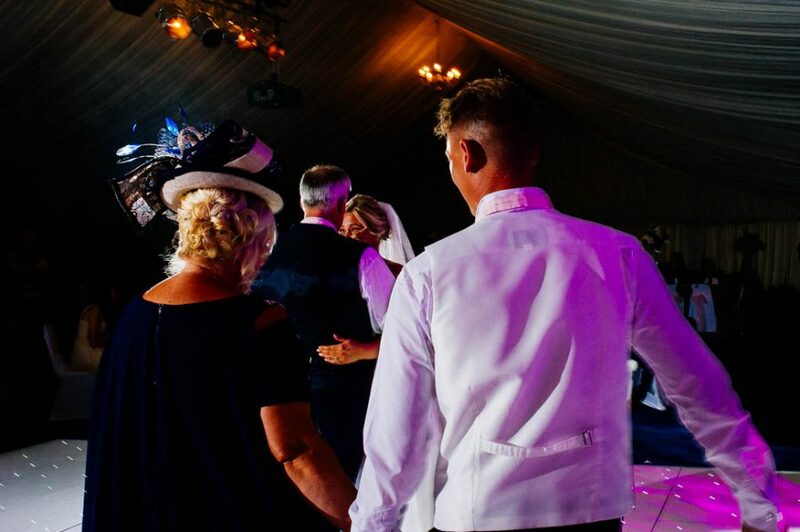 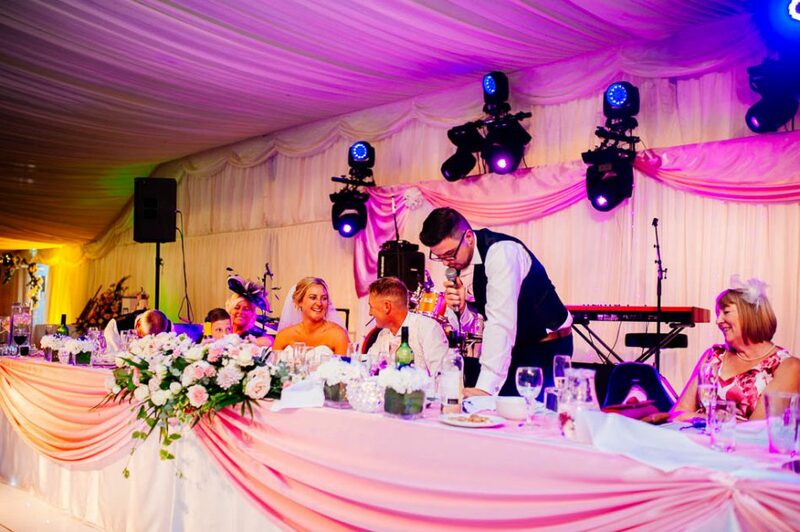 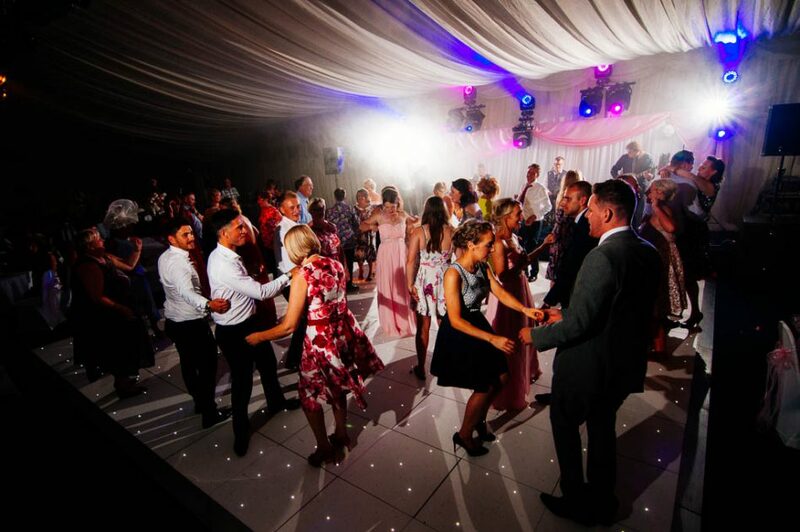 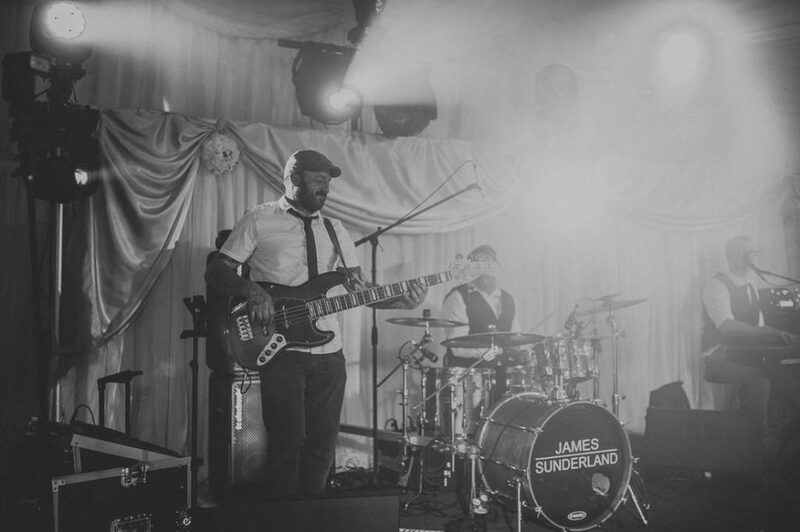 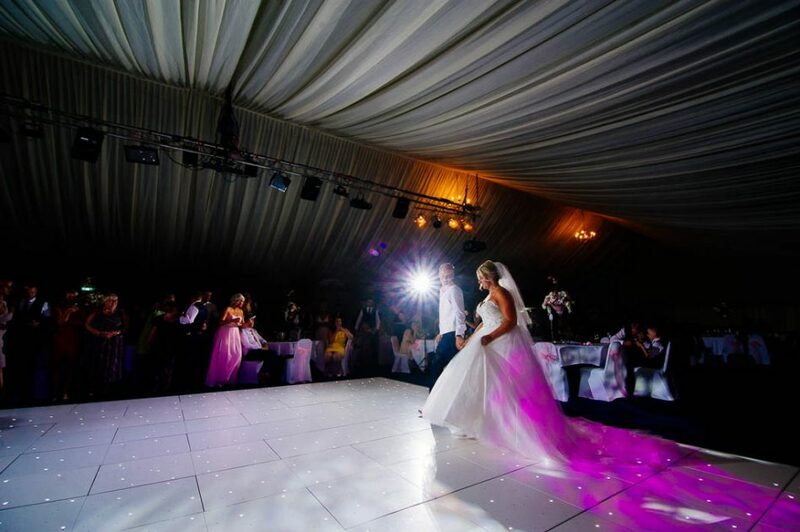 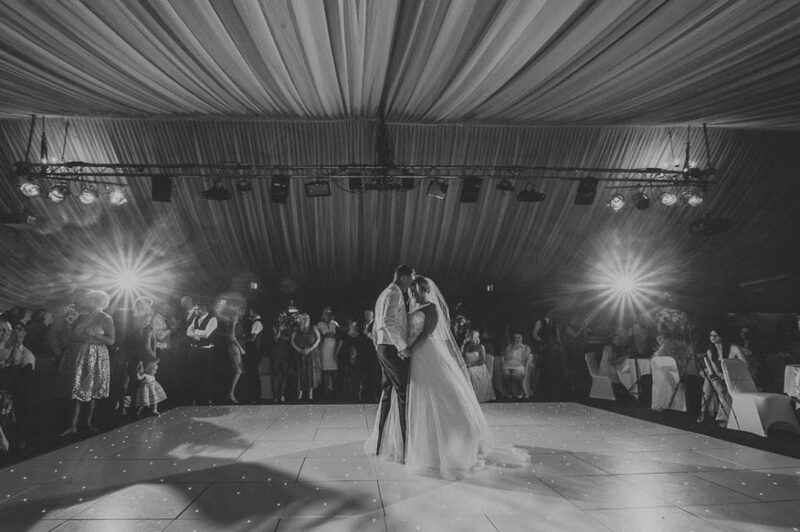 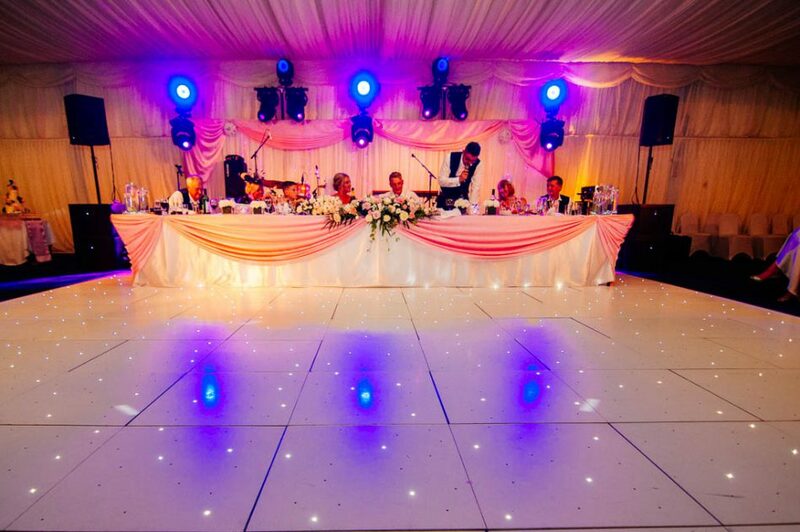 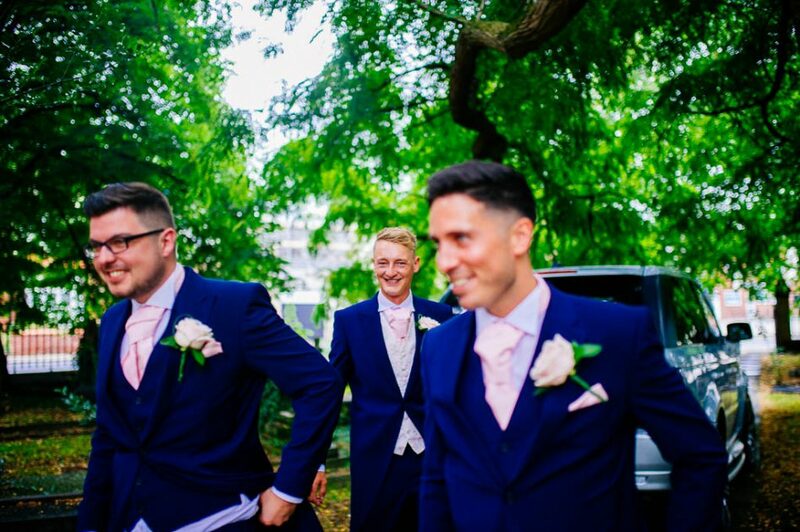 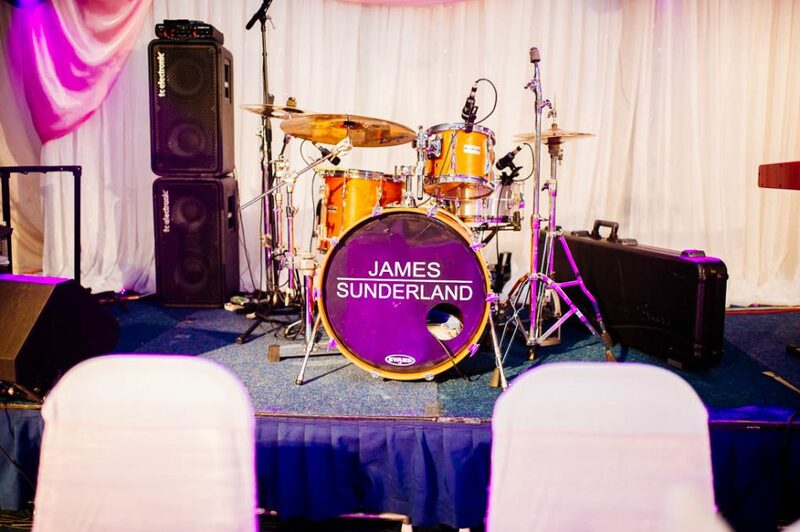 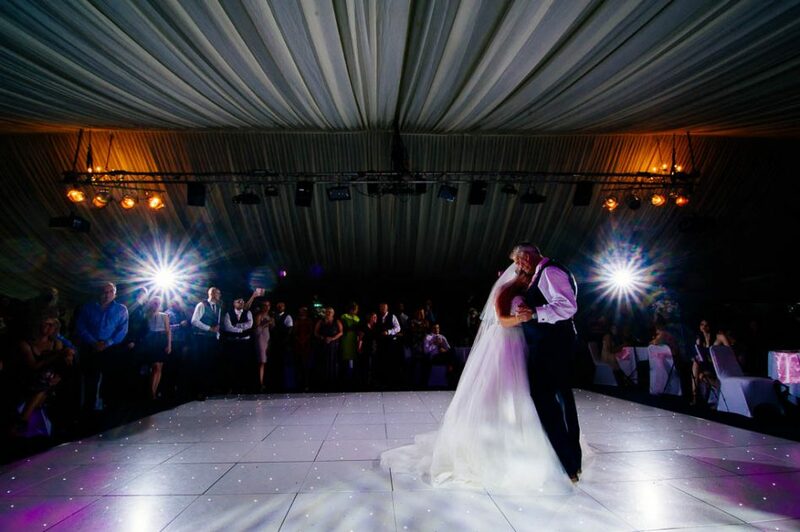 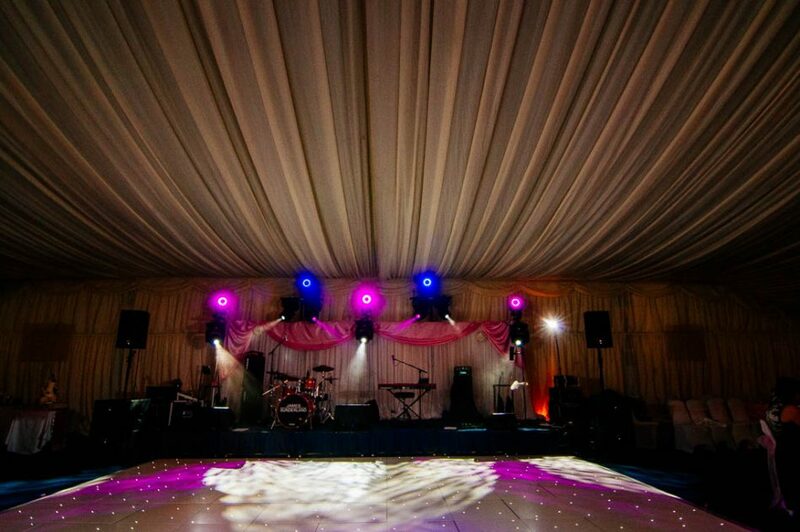 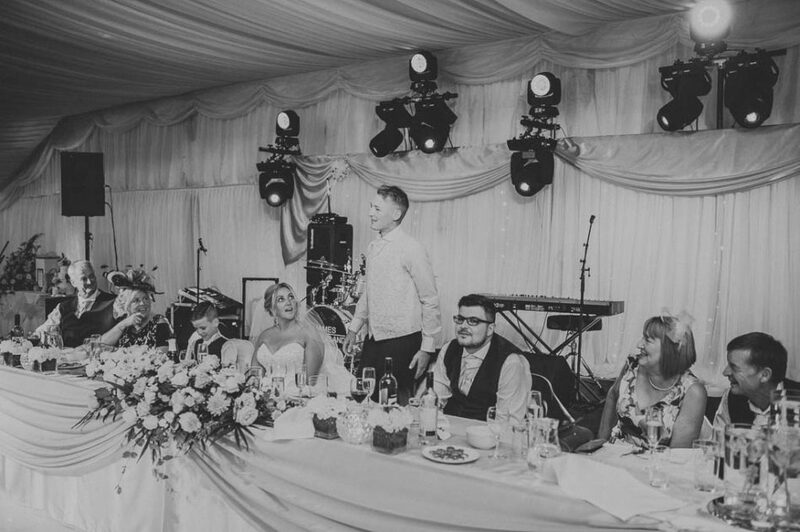 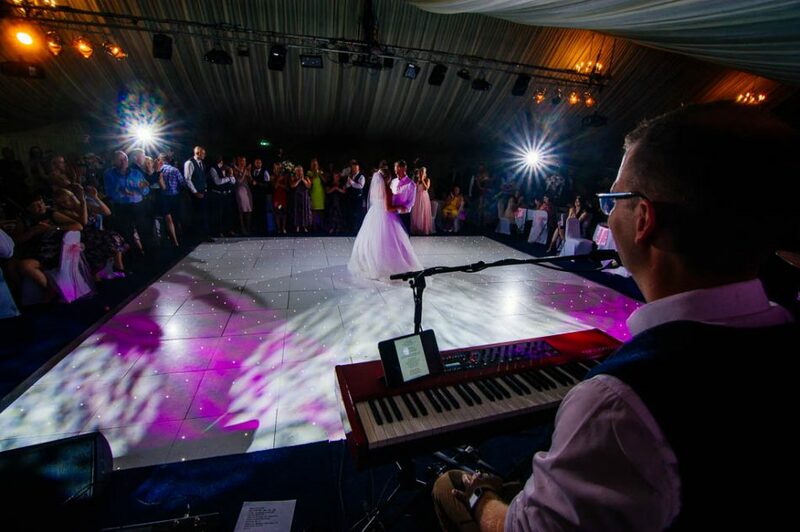 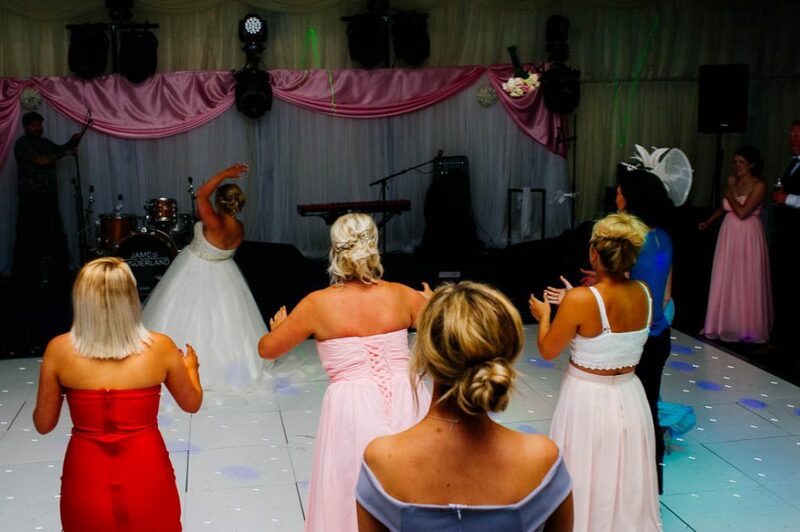 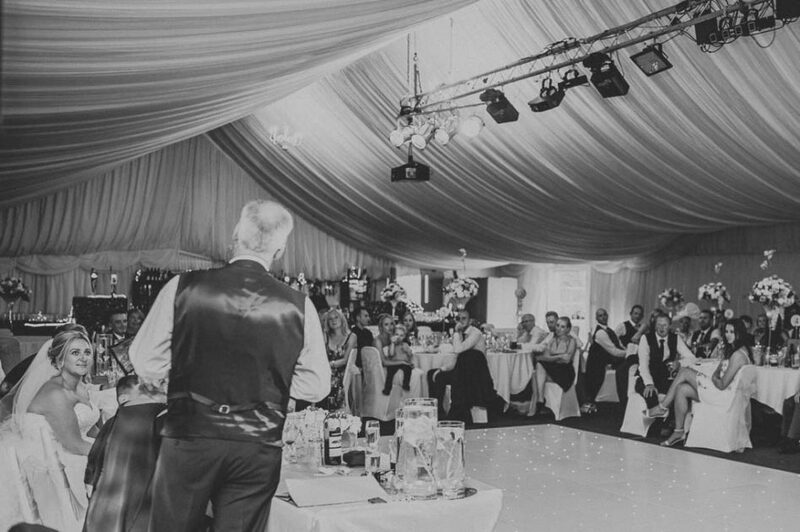 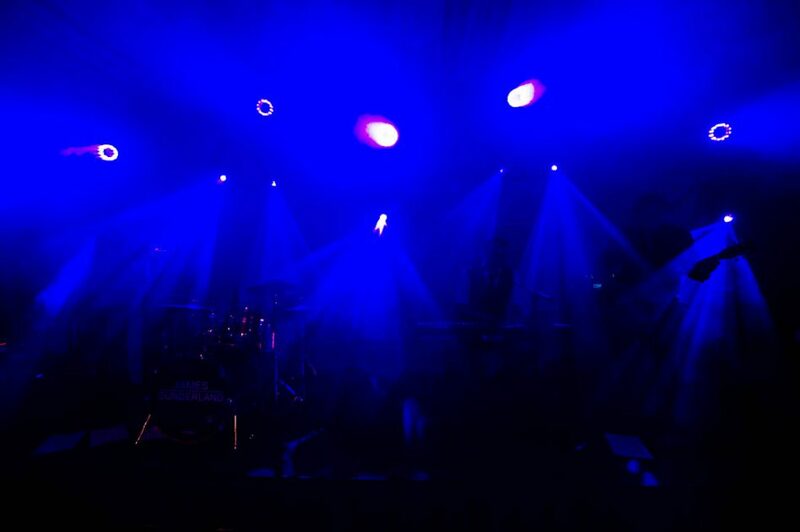 After most of the tears had been wrung out from the guests, the dancing kicked off with the energetic sounds from the James Sunderland band. 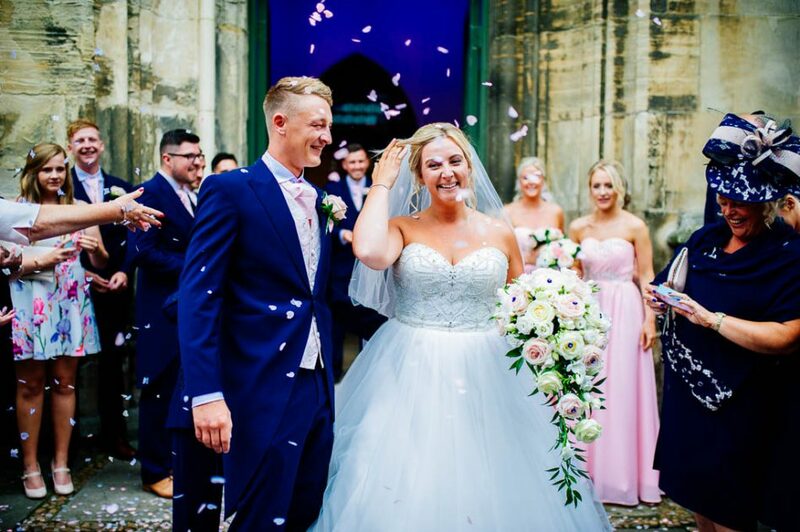 It was a truly magical fairytale wedding and I’m so glad I was there to capture the memories of the day for this truly special couple.